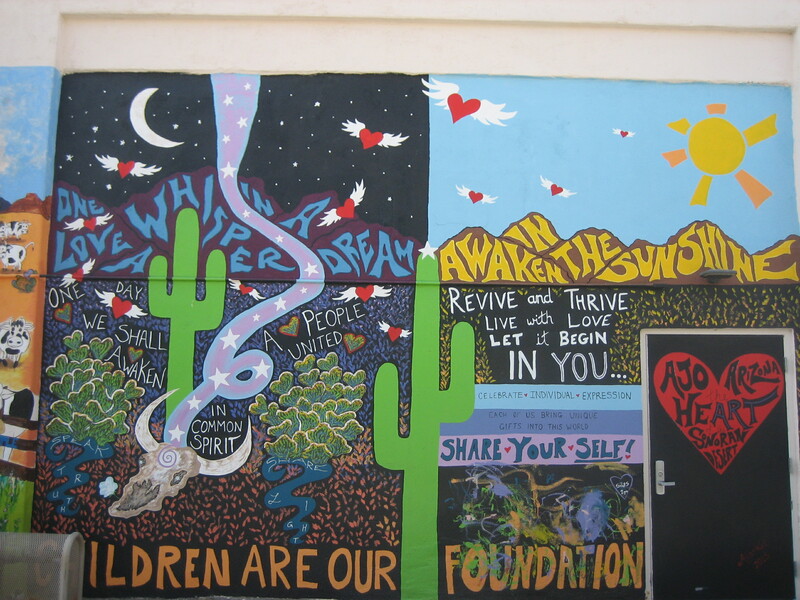 As I mentioned in yesterday’s post, this mural is painted on the side of the building housing Roadrunner Java in Ajo, Arizona. 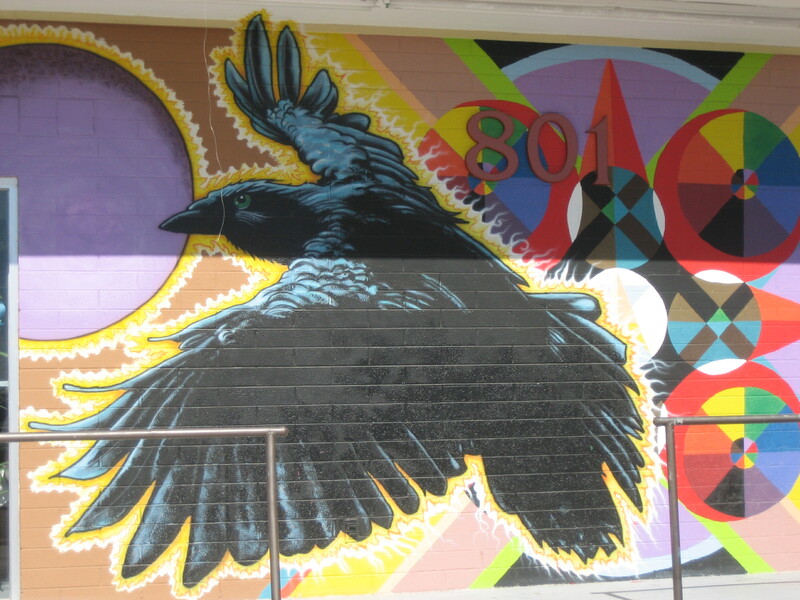 (Roadrunner Java is located at 932 North 2nd Avenue. 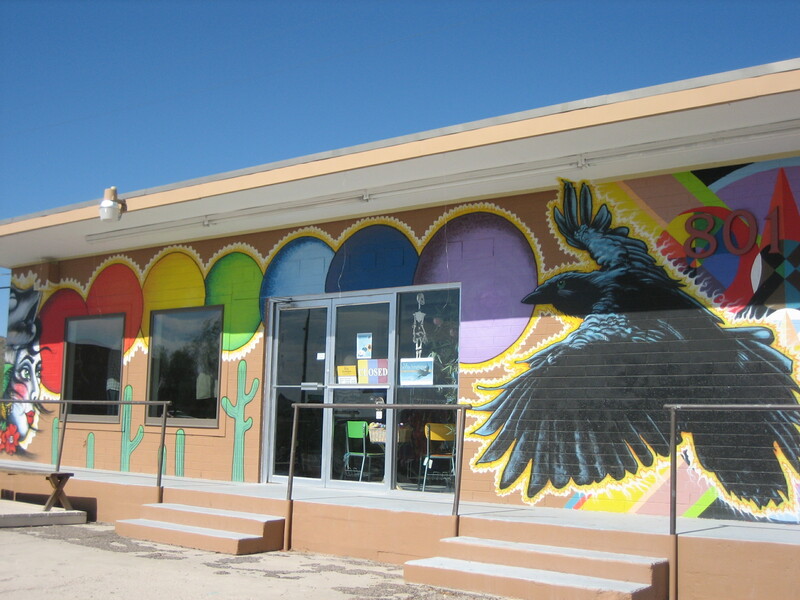 North 2nd Avenue is the same thing as Highway 85, so this cafe is on the main drag, on the east side of the street.) 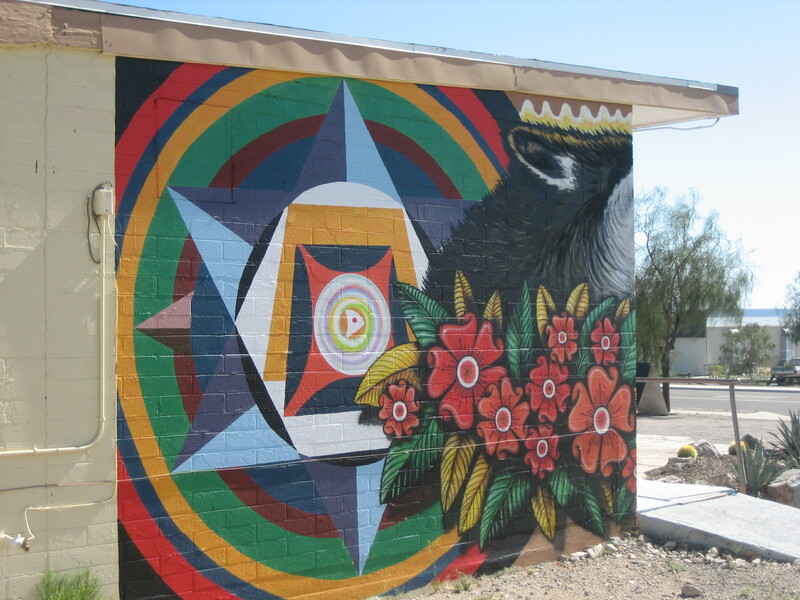 I was told the mural was painted by Ajo muralist Mike “DaWolf” Baker. 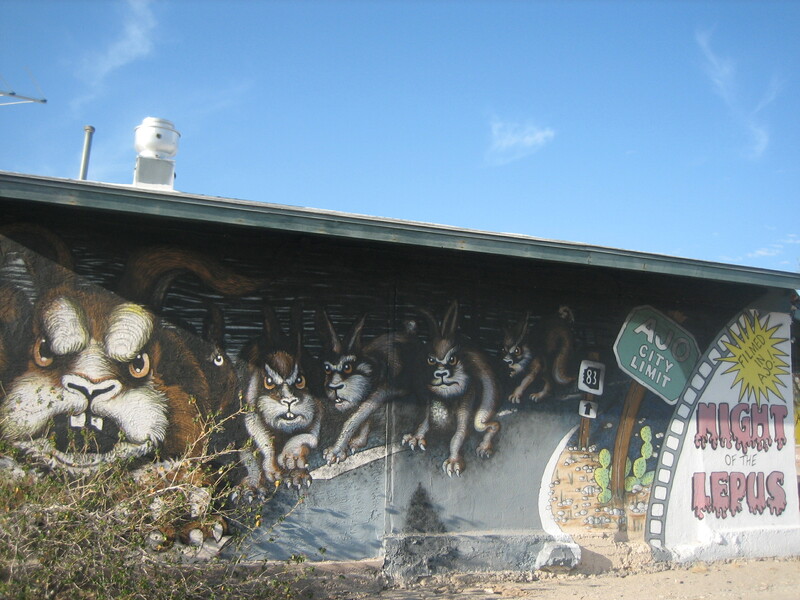 According to the mural Night of the Lepus was filmed in Ajo. What in the world is Night of the Lepus? you may ask. You may also wonder, Why do those rabbits look so mean? Night of the Lepus (also known as Rabbits) is a 1972 American science fiction horror film based on the 1964 science fiction novel The Year of the Angry Rabbit. Released theatrically on July 26, 1972, it focuses on members of a small Arizona town who battle thousands of mutated, carnivorous killer rabbits. The film was the first science fiction work for producer A. C. Lyles and for director William F. Claxton, both of whom came from Western film backgrounds. Character actors from Westerns the pair had worked on were brought in to star in the Night of the Lepus, including Stuart Whitman, Janet Leigh, Rory Calhoun, and DeForest Kelley. 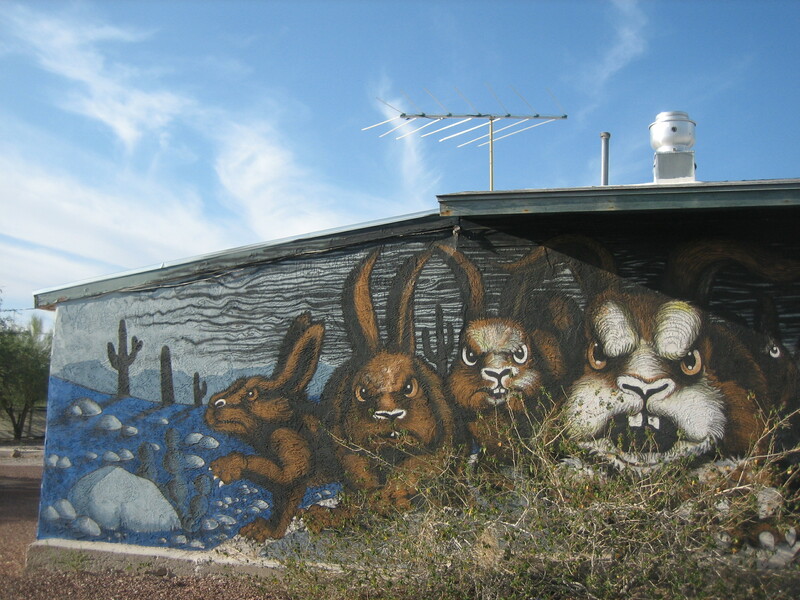 Shot in Arizona, Night of the Lepus used domestic rabbits filmed against miniature models and actors dressed in rabbit costumes for the attack scenes. Ok, wait. Could we read the last part of that last sentence again? 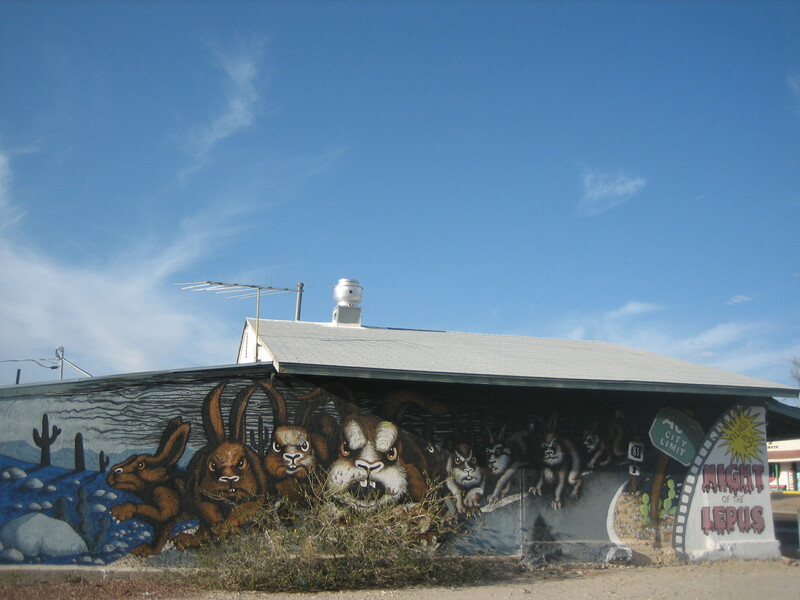 …Night of the Lepus used domestic rabbits filmed against miniature models and actors dressed in rabbit costumes for the attack scenes. 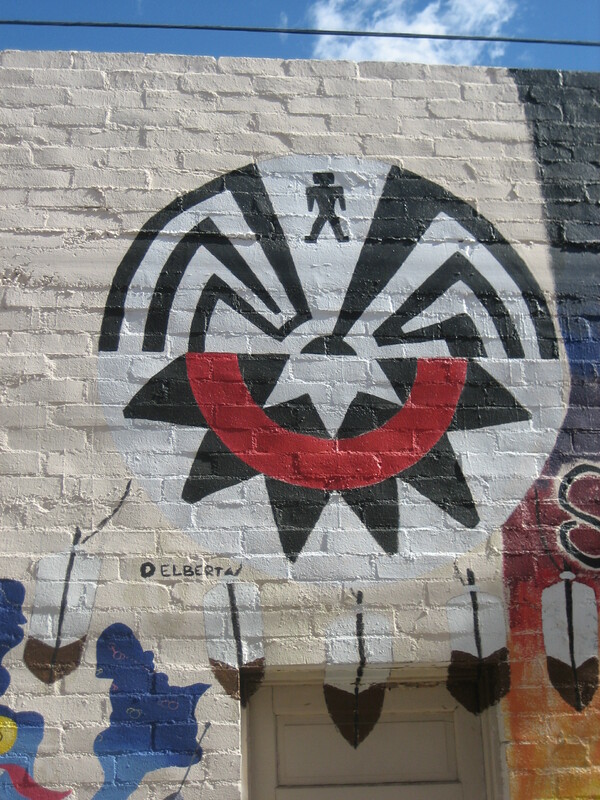 To depict the rabbit attacks, a combination of techniques were used. For some scenes, the rabbits were filmed in close-up stomping on miniature structures in slow motion. For attack scenes, they had ketchup smeared on their faces. For other scenes, human actors were shown wearing rabbit costumes. So this movie tried to scare people with regular pet bunnies moving among (and probably knocking over) miniature models? And to make them scarier, the bunnies were filmed with ketchup smeared on their faces! (Oh, that’s scary!) And then when they needed the bunnies to be really, really scary, they put human people in rabbit costumes? I haven’t seen one minute of this movie, but I’m already laughing. Originally titled Rabbits, production company MGM renamed the film, using the Latin name for “rabbit” in hopes of keeping the audience from presuming the animals would be non-menacing. To further prevent the audience from thinking of cuddly bunnies in relation to the film, the theatrical posters featured no rabbits, instead displaying only eyes and referencing unnamed “creatures”. The trailers showed no critters, and the press releases only mentioned that the film had “mutants.” The only clue given to the audience was the required acknowledgment on the poster to Braddon’s novel. However, some Night of the Lepus promoters gave away the secret by sending out souvenirs decorated with rabbit’s foot designs. felt Night of the Lepus was one of the “most ridiculous horror film[s] ever conceived”, with a poor blend of horror and environmentalism that resulted in it being more of a comedy. He criticized the “primitive special effects”, badly done editing and laughable dialogue, and noted that while the rabbits and actors are rarely seen on screen together, the filmmakers used obviously fake rabbit paws and people in rabbit suits for the few scenes calling for human/rabbit interactions. Like most critics, he pointed out that the rabbits were “cute bunnies” rather than “fanged, disease-ridden mutated creatures”, but he felt the actors did the best they could with the material, and praised them for “[keeping] straight faces as they heroically stand against the onslaught of the bunnies”. 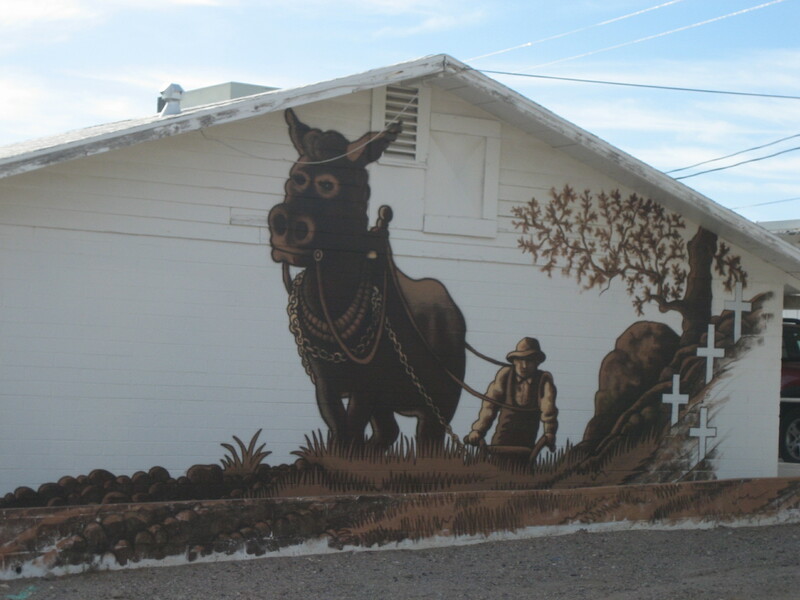 Sounds like the mural in Ajo is more artistic and more entertaining than the movie that inspired it. 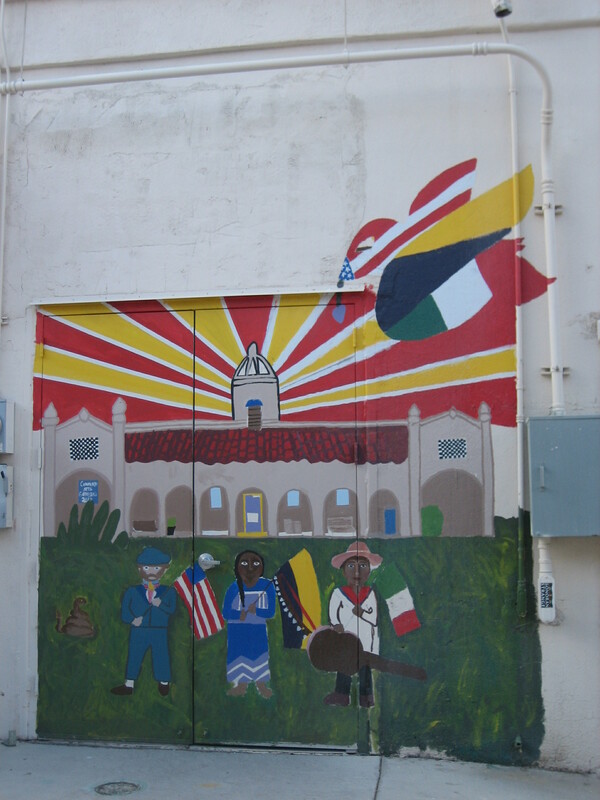 I do wish someone would remove the bush blocking the view of the mural. The bush is distracting and makes the building seem abandoned. 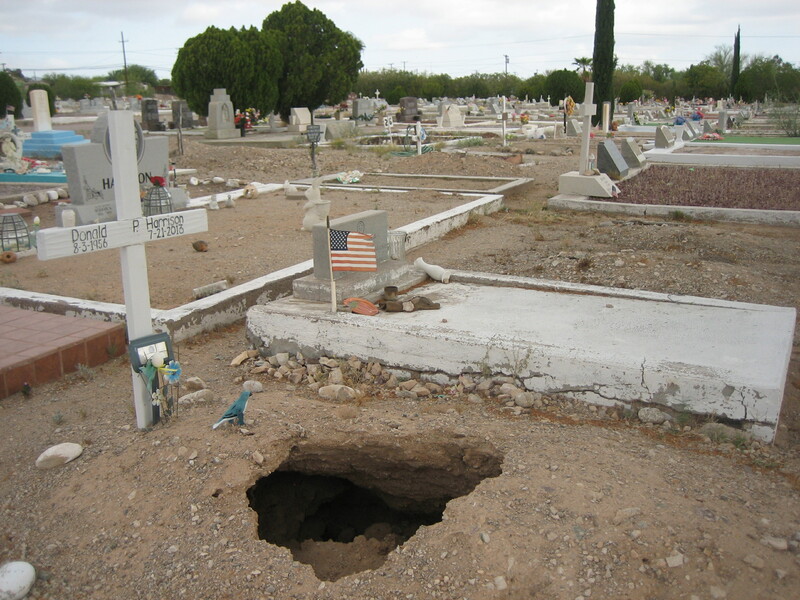 As I walked through the Ajo Cemetery in Ajo, Arizona I saw a large cross which looked as if it were constructed from concrete and stone. I first saw it from the back, so it was initially the size of the cross that caught my attention. The cross was taller than all the other markers around it, and I decided to go over and get a better look. When I walked around to the front of the cross, I found that it was covered with words. 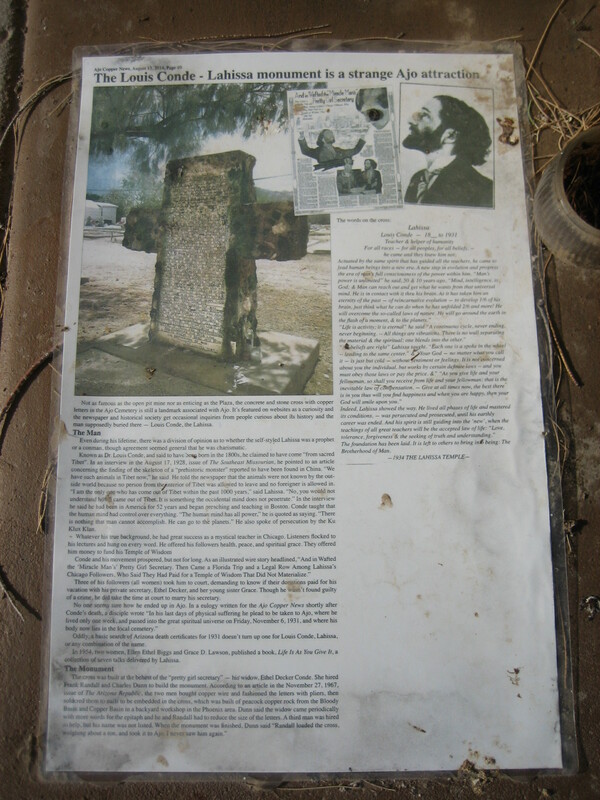 I also found an article (laminated for protection and adhered to the concrete over the grave site) about the cross. 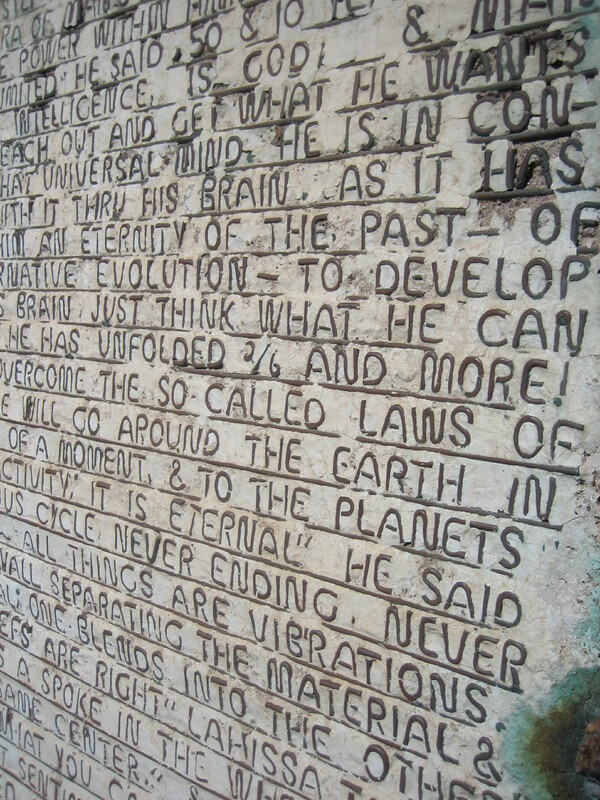 the inscription on the marker contains about 400 words. Even more unusual than that, each letter and number was manually formed with copper wire. After being bent into the desired shape, the letters and numbers were soldered to nails and embedded into the face of the cross. 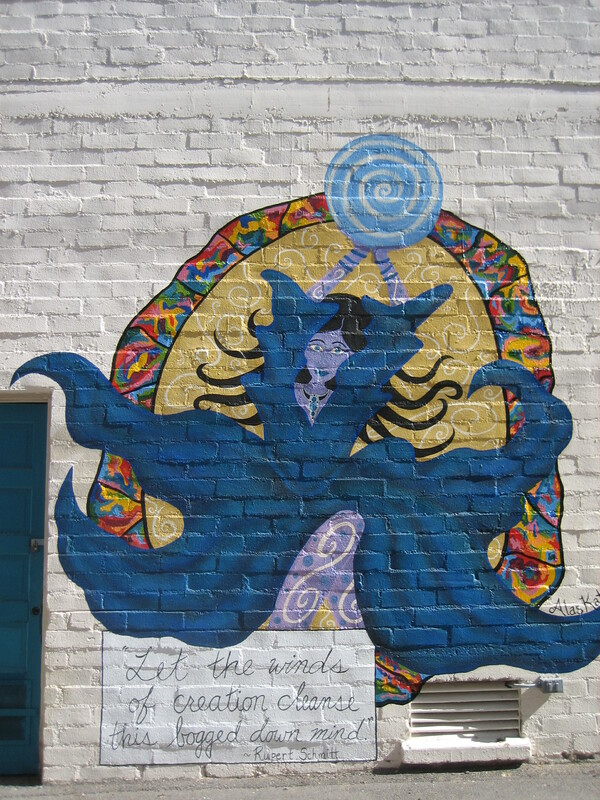 …[Conde] had great success as a mystical teacher in Chicago. Listeners flocked to his lectures and hung on every word. 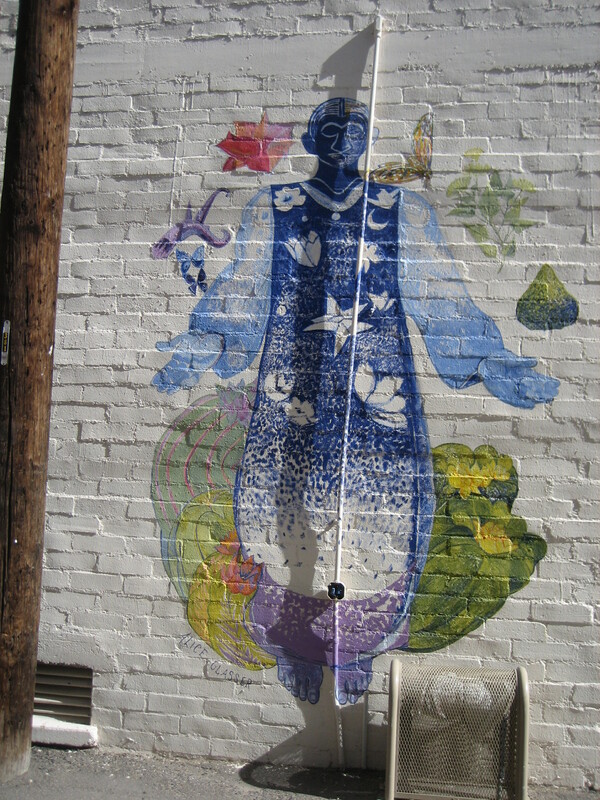 He offered his followers health, peace and spiritual grace. They offered him money to fund his Temple of Wisdom. 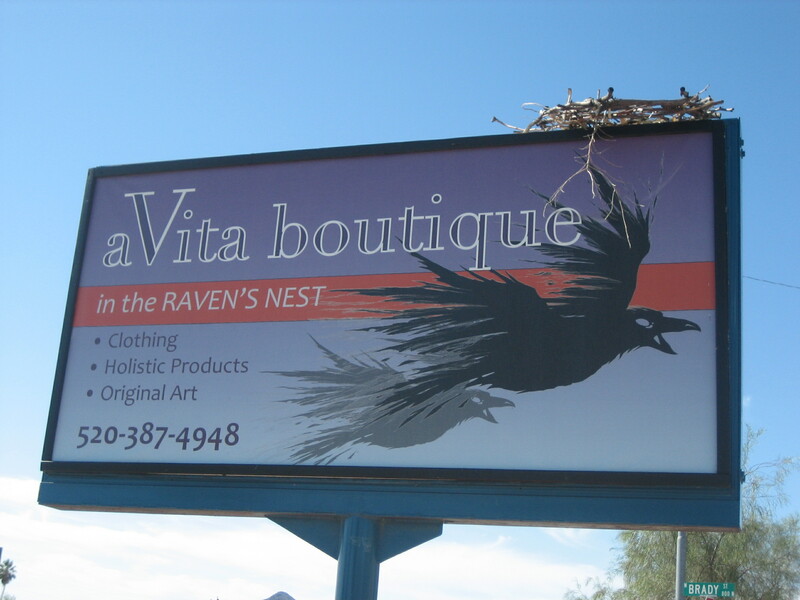 No one seems to know how he ended up in Ajo. plead to be taken to Ajo, where he lived only one week. of peacock copper rock from the Bloody Basin and Copper Basin. 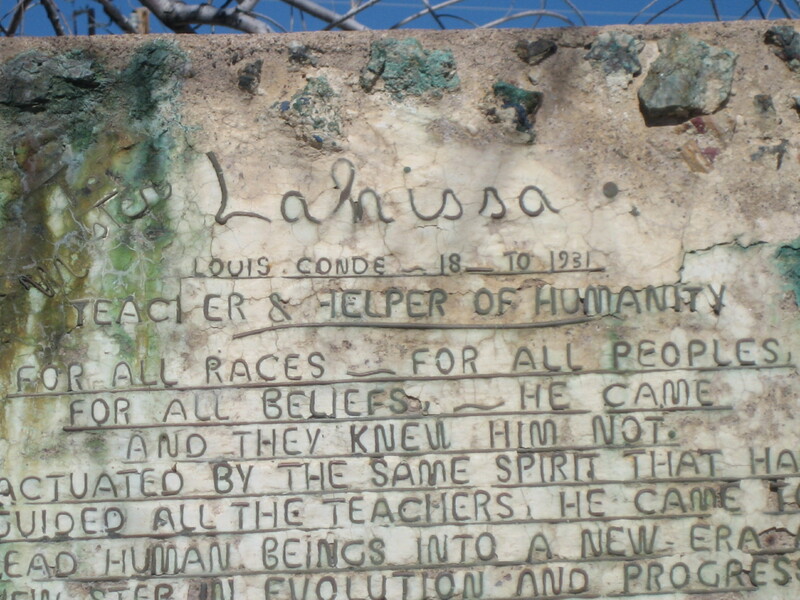 LOUIS CONDE — 18__ to 1931Teacher & helper of humanityFor all races — for all peoples, for all beliefs, — he came and they knew him not. The foundation has been laid. 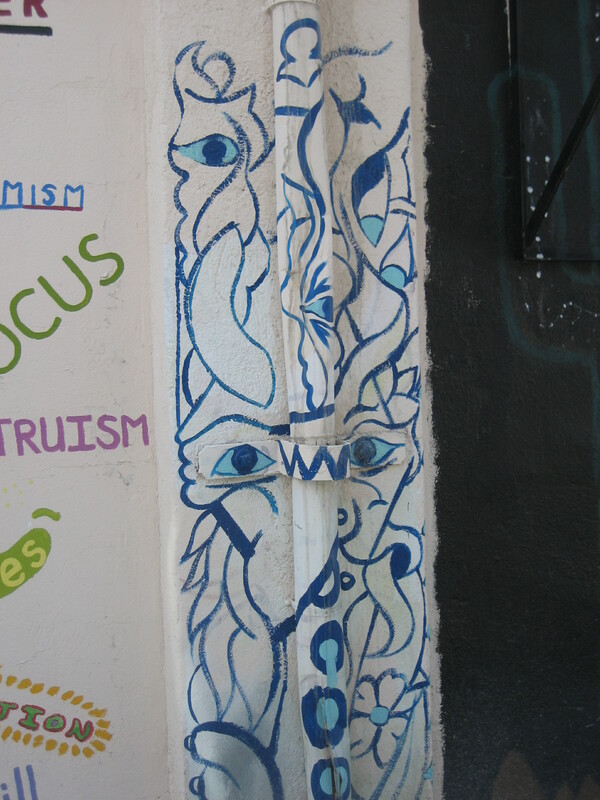 It is left to others to bring into being: The Brotherhood of Man. 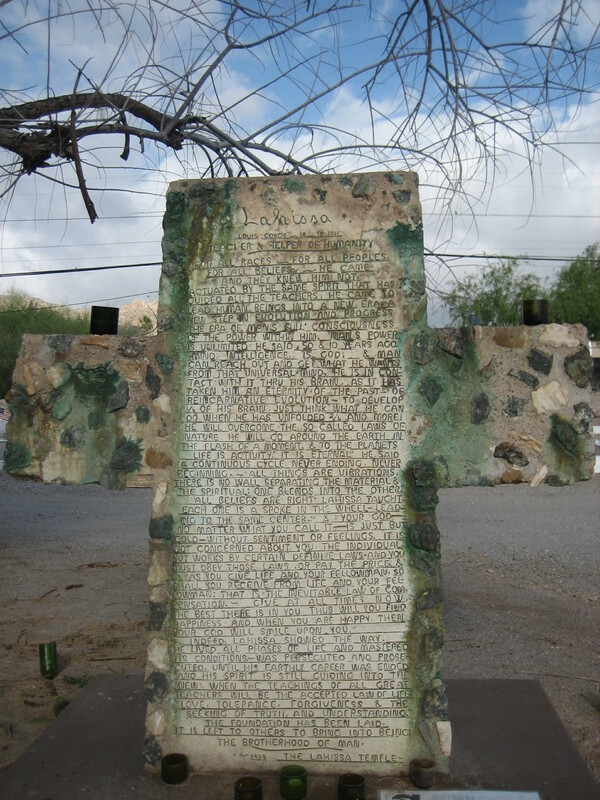 The monument is near the west edge of the Ajo Cemetery. 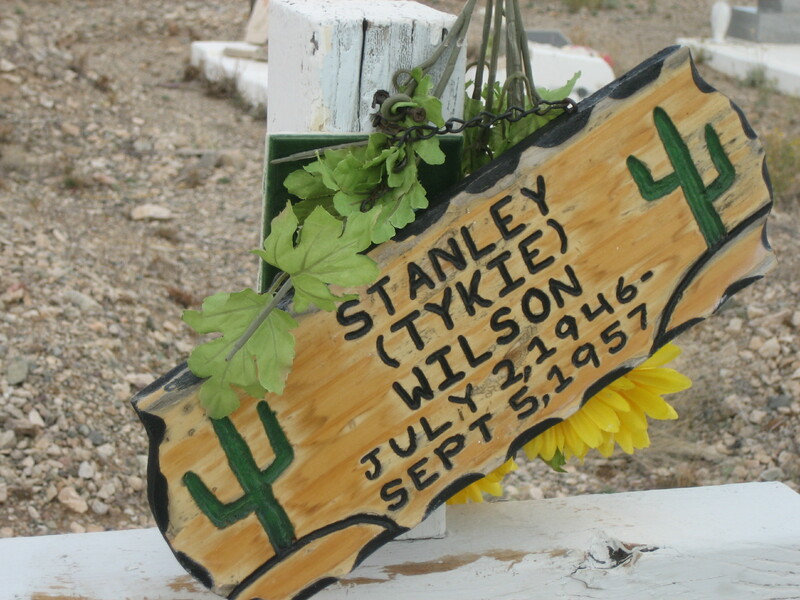 I hadn’t been walking through the Ajo Cemetery (in Ajo, AZ) very long before the lyrics to the song “Cemetry Gates” by The Smiths were running through my head. 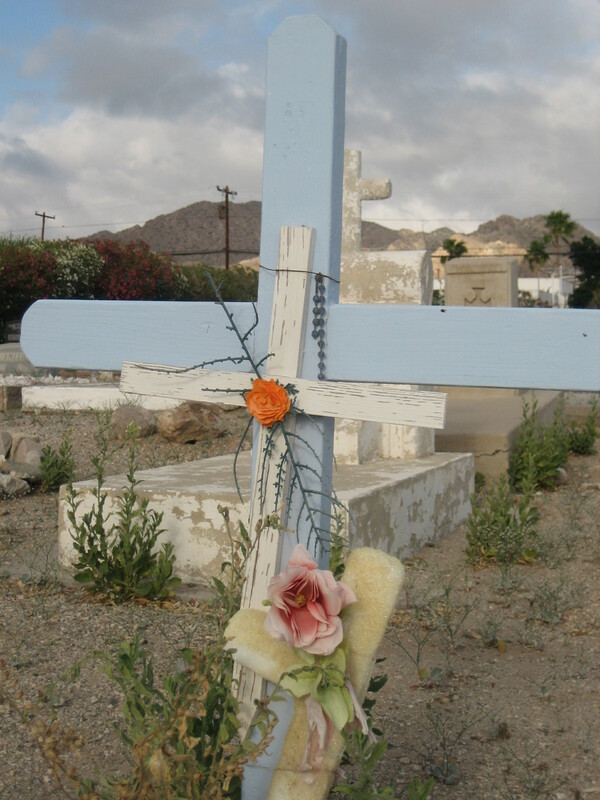 While I walked through the Ajo Cemetery I did what Morrissey and Johnny Marr must have done before they wrote the song: I read the headstones and I wondered about those people. 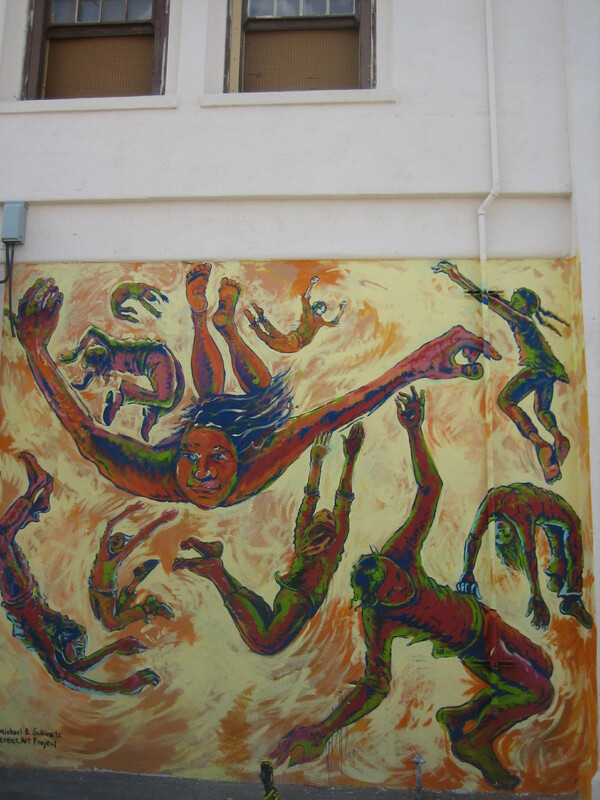 Who were they? What were they like? What were their loves and hates and passions? Headstones really tell so little about those who have passed away. Did anyone living remember the people buried in the ground under me, and if not, were the deceased in any position to care? I took photos of some of the headstones I thought were particularly interesting, the ones that made me wish I knew the stories of the people buried beneath them. 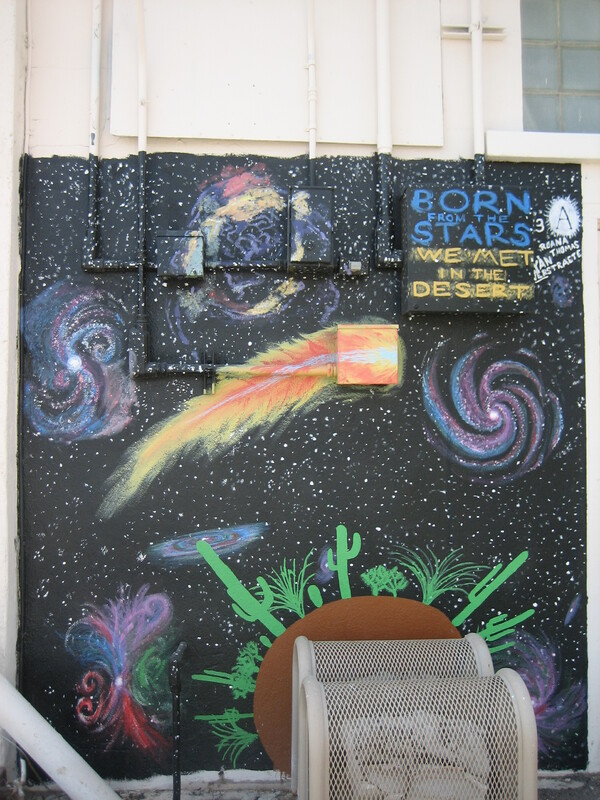 They were born. They lived. And now they’re dead, but we can remember them, even if we never knew them. Dude! In 1869, a family named their little baby daughter Cindarella. How cool is that? I wonder if and how this woman’s name shaped her life. 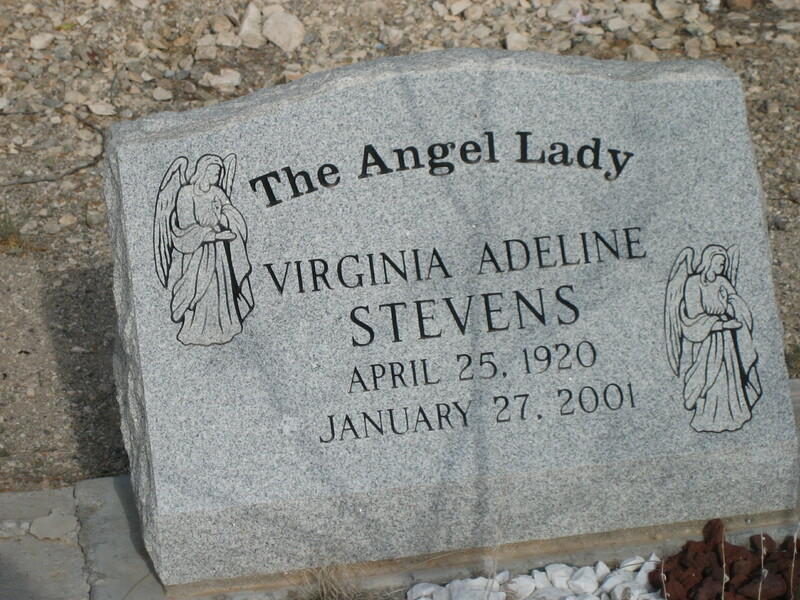 Why was Virginia Adeline Stevens called The Angel Lady? What did she do? 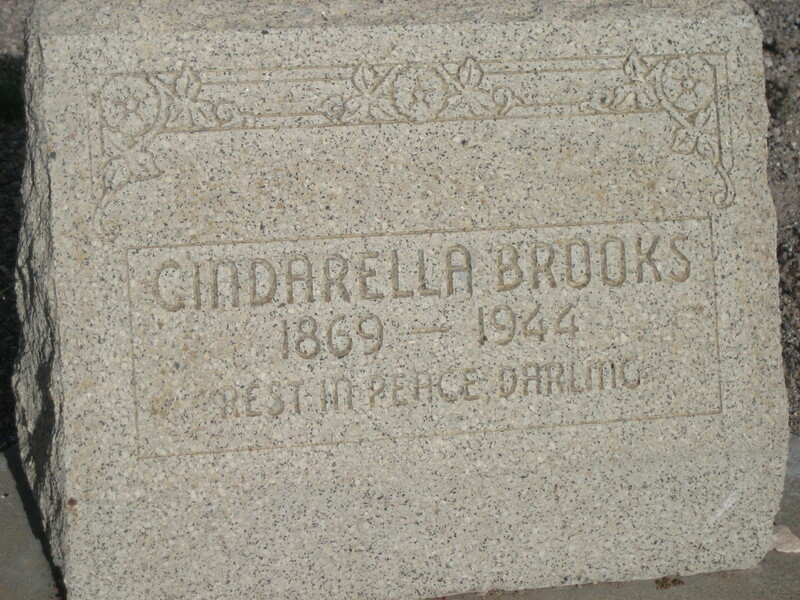 Her headstone is featured on Findagrave.com, but I couldn’t find any information about her. 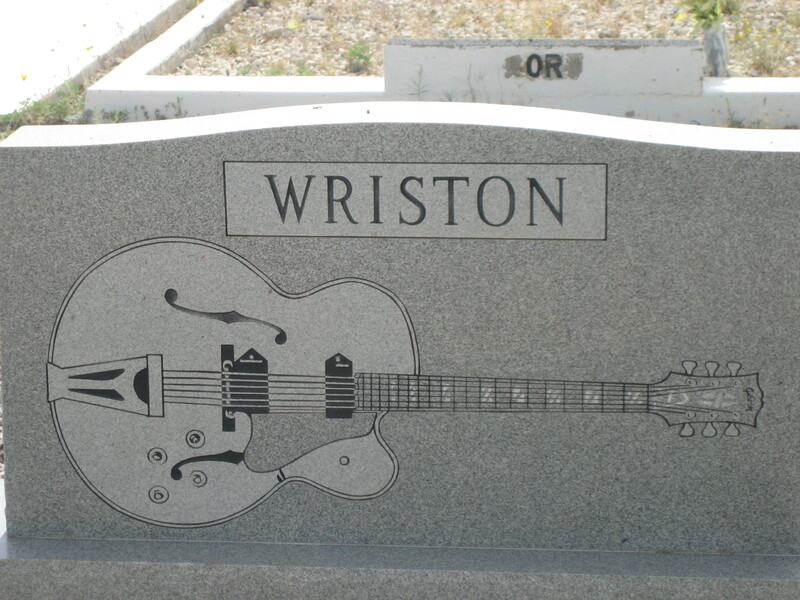 I think Wriston liked guitars. I would guess s/he played. But that’s just a guess. 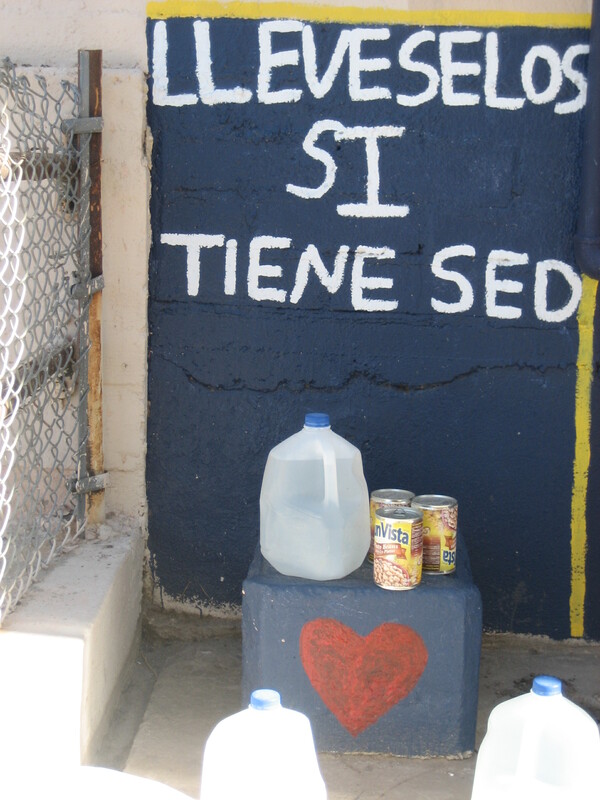 Someone left a beverage for Canuto De La Torre. 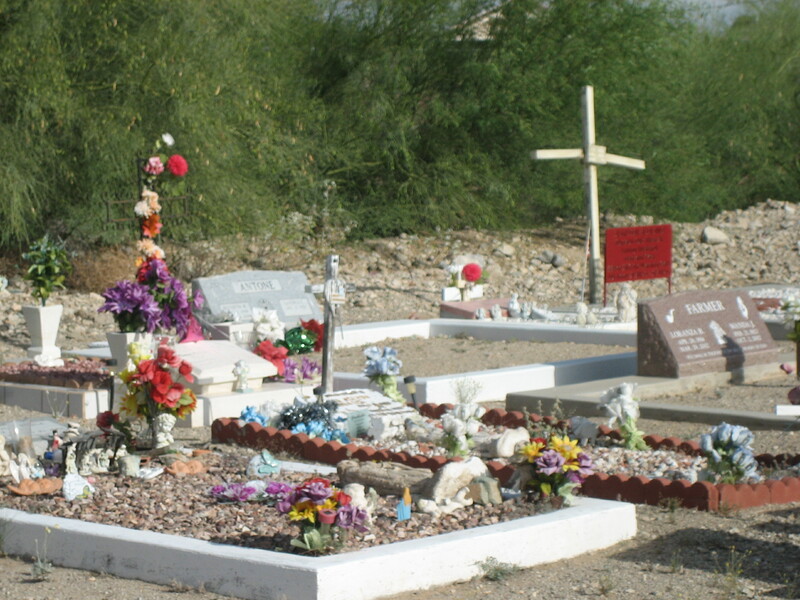 The Ajo Cemetery was the first place I saw offerings of soft drinks left on graves. 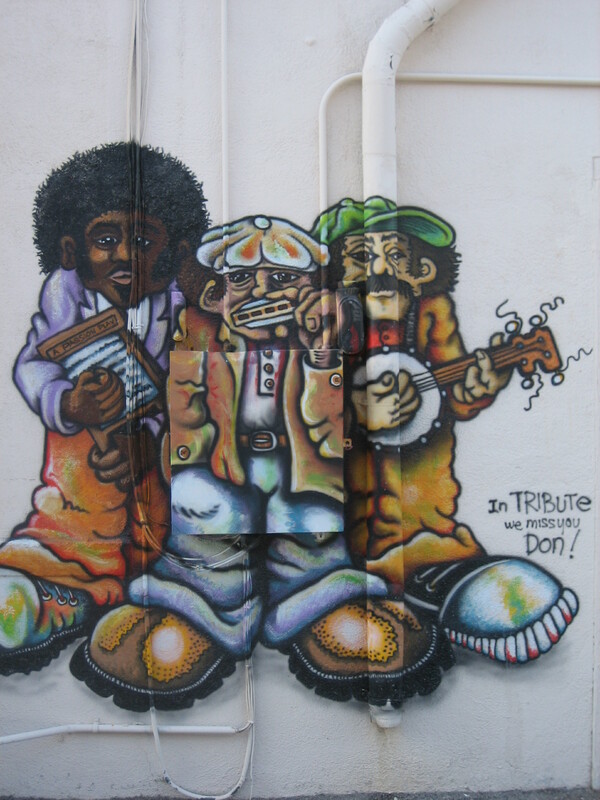 Canuto is remembered. 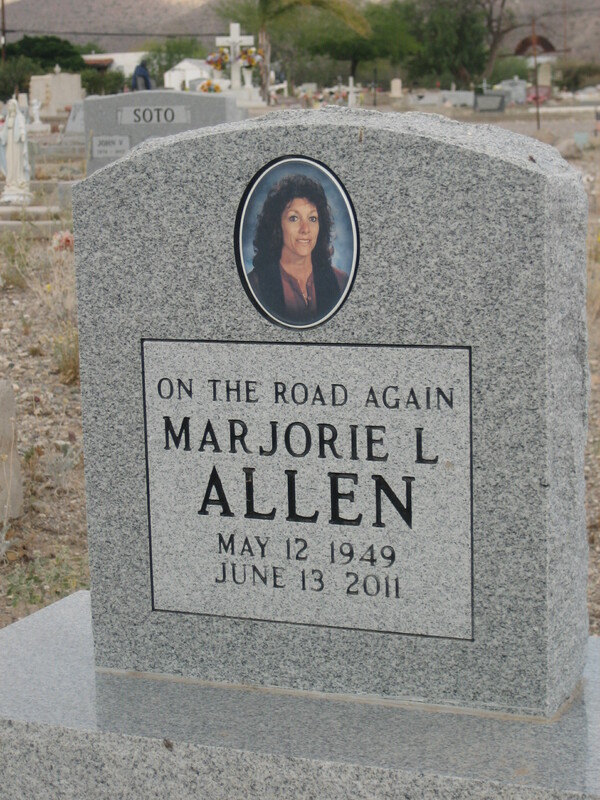 Marjorie L. Allen is on the road again. I wonder if she was a fan of the song by Willie Nelson or the one sung by Canned Heat. Maybe this memorial reflects her personal philosophy. I think I would have enjoyed knowing her. This marker looks handmade. I like that. I wonder what Tykie was like and what happened to him. I like “nature loving desert rat.” That’s that, folks. That’s that. I took all the photos in this post, except the album cover. That’s an Amazon associates link. If you click on the image, it will take you to Amazon where anything you put in your cart and purchase will earn me a small advertising fee. I was looking for a garage sale, but I found the cemetery instead. I didn’t need more stuff, so I decided to walk through the cemetery instead of browsing through the discards of someone’s life. I ended up spending almost two hour there. 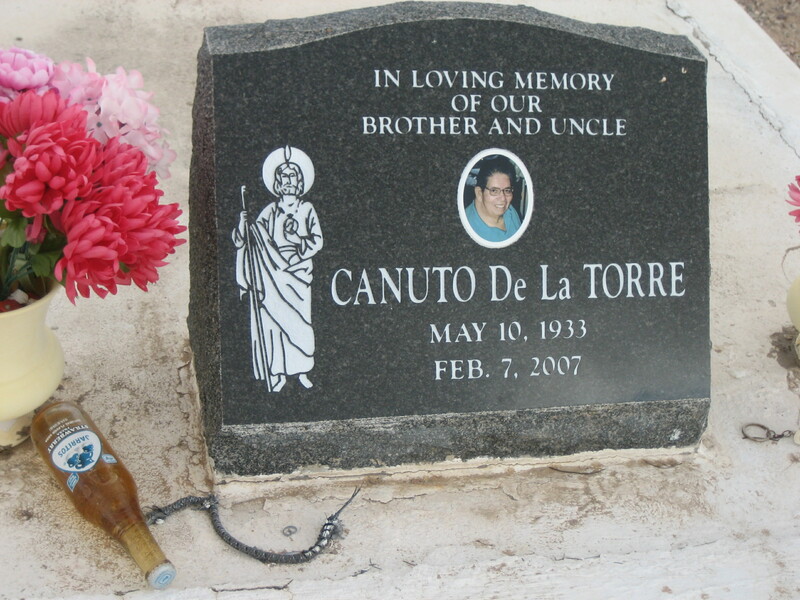 One thing I noticed about the cemetery is that based on last names, it seemed to be quite integrated. 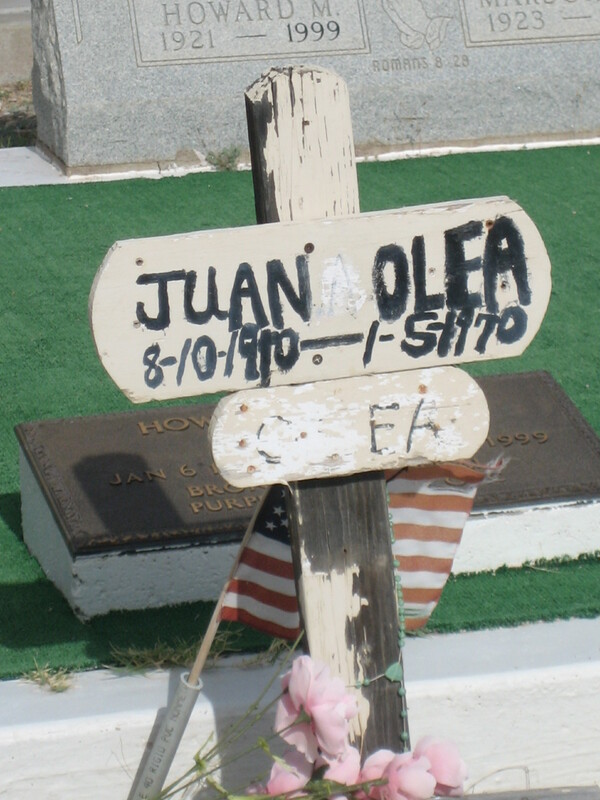 People with what seemed to me to be Anglo names were buried in close proximity to people with what seemed to me to be Latino/a names. In addition to many professionally carved headstones, more than a few of the graves were marked by amateur endeavors. I liked the handmade crosses and handwritten signs. They seem more personal and loving than cold stone. Seeing people’s handwriting (sometimes messy, sometimes with letters ever-so-carefully written) made me recognize a real connection between the living and the dead. 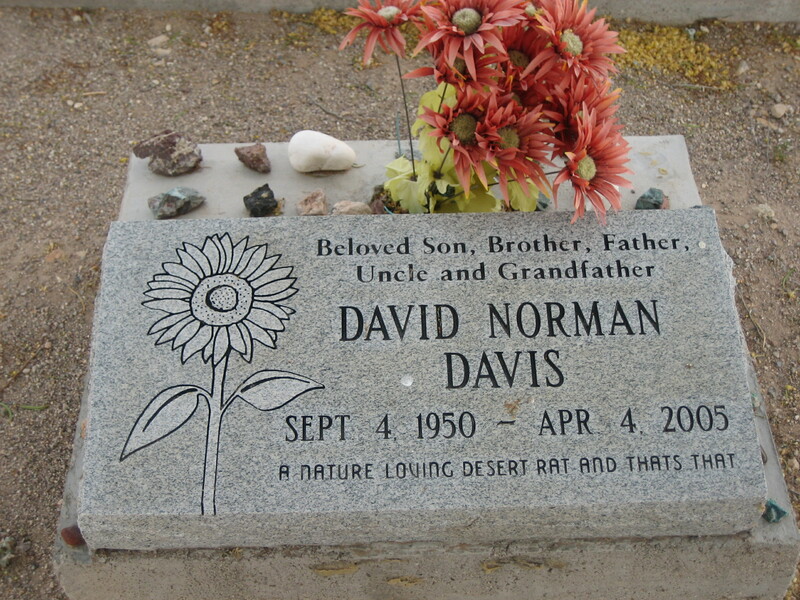 It’s easy for me to look at graves in a cemetery and think of the people buried there as in the abstract, but seeing the handwriting on grave markers as a connection between the living and their dead, made the dead seem more like real people. 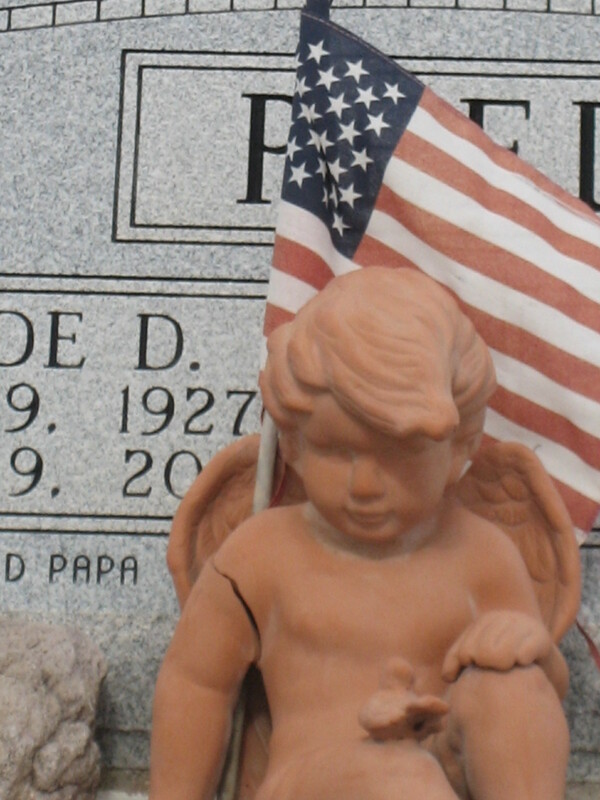 I saw several things in the Ajo Cemetery that I’d never seen at other graveyards. 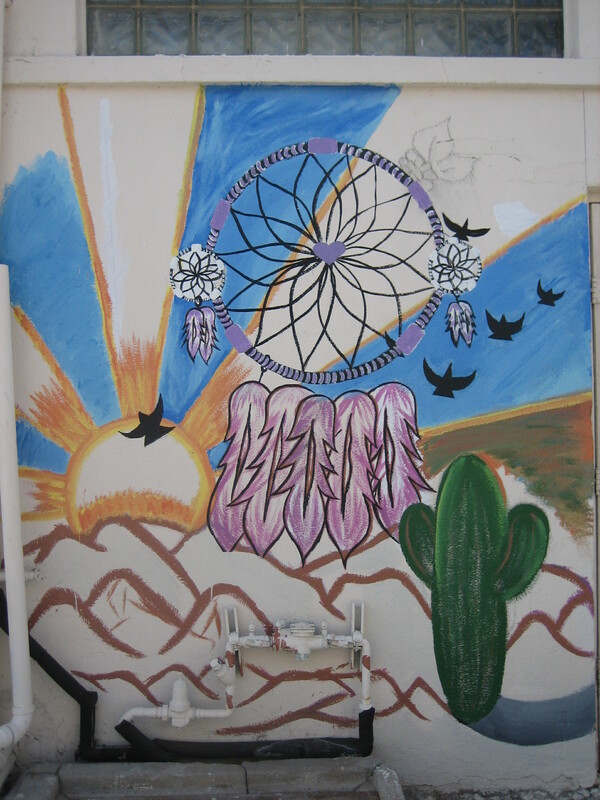 The first thing I saw was saguaros! In the cemetery! Saguaros in the cemetery! 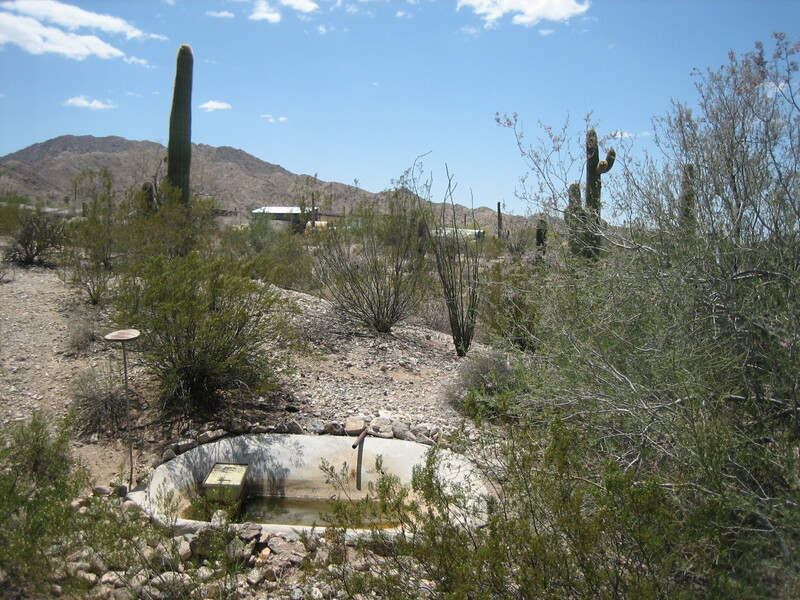 It wasn’t a huge shock, as the cemetery is in the Sonoran Desert and saguaros grow in the Sonoran Desert, but I was surprised to see the huge cacti. 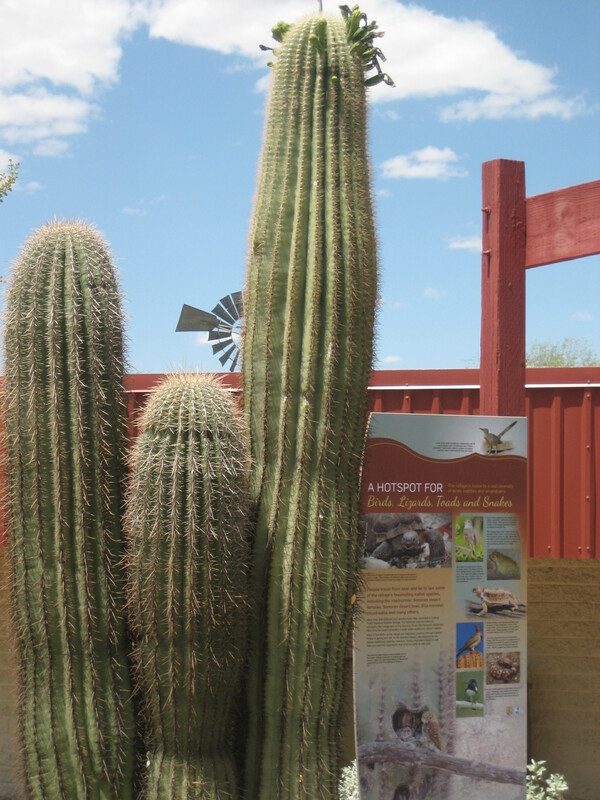 These were some seriously big saguaros, which means seriously old, saguaros. I’m glad they didn’t get pulled up or cut down to make room for the graveyard. 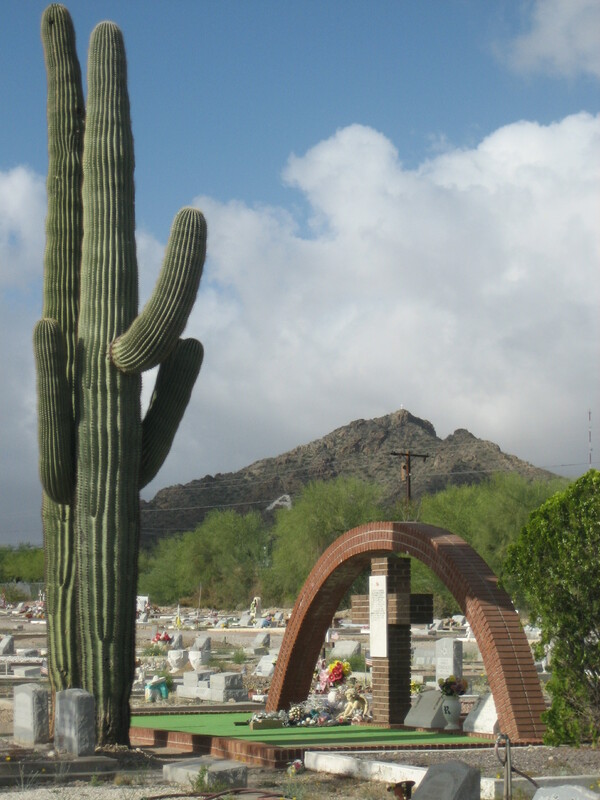 I love this photo showing the two saguaros presiding over Ajo Cemetery while A Mountain stands in the background. I wasn’t even trying to get the mountain in the background, and I didn’t realize the Ajo “A” would show up so clearly. This is one of those photos I look at and think, How did I do that? 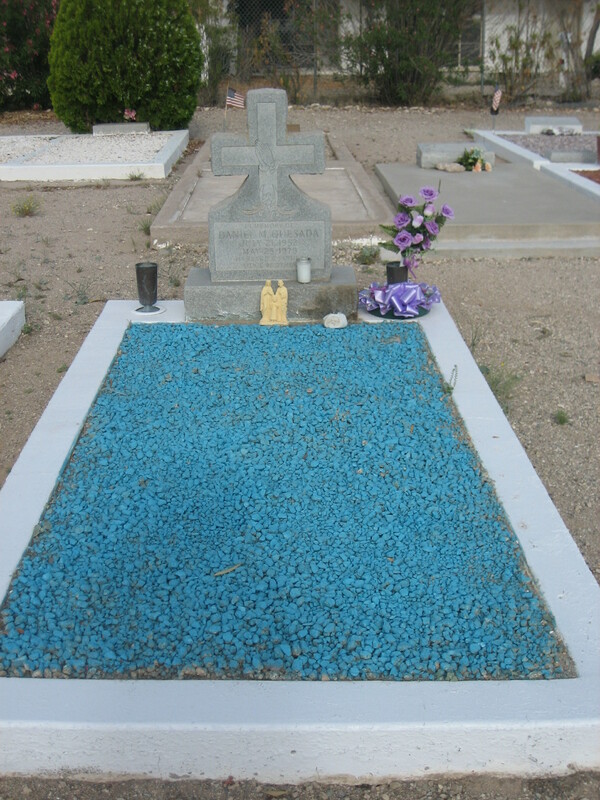 I’d never seen graves covered with painted gravel before, but I saw them at the Ajo Cemetery. 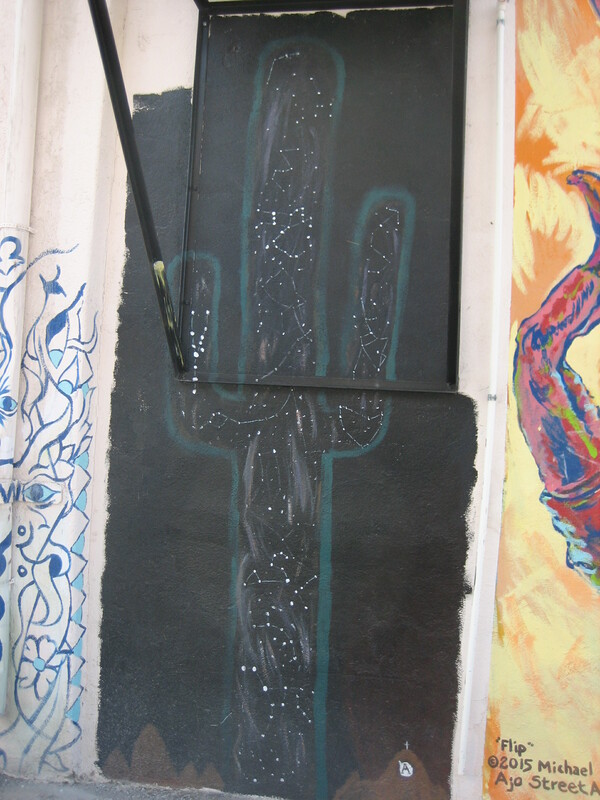 I saw a couple of those, each with the gravel painted different, bright colors. I wonder why. Why gravel, I mean. I sort of understand people who think painted gravel looks prettier than plain gravel wanting to paint it, but why put gravel on a grave site in the first place? Maybe to try to keep the dust down? 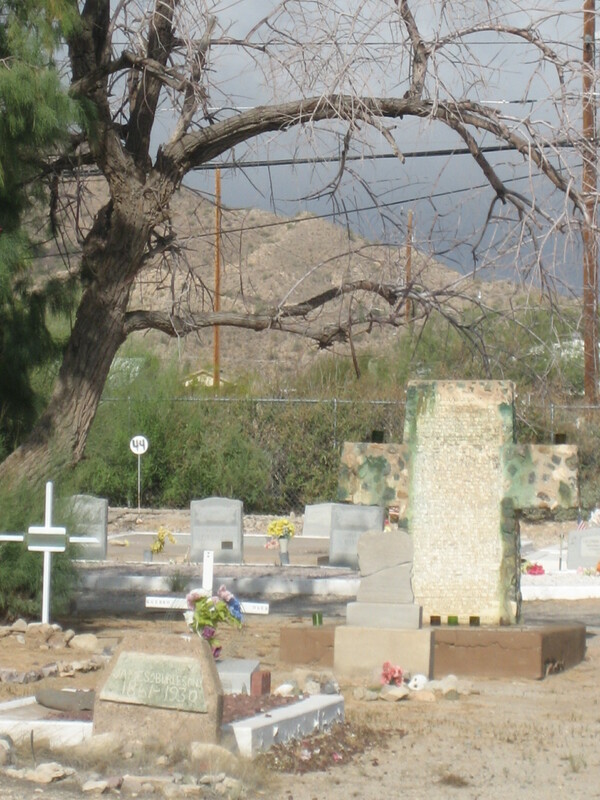 When I visited the Old Kernville Cemetery (read about that experience here: http://www.rubbertrampartist.com/2015/05/29/old-kernville-cemetery/), I encountered a couple of graves upon which an unopened Bud Light had been placed. 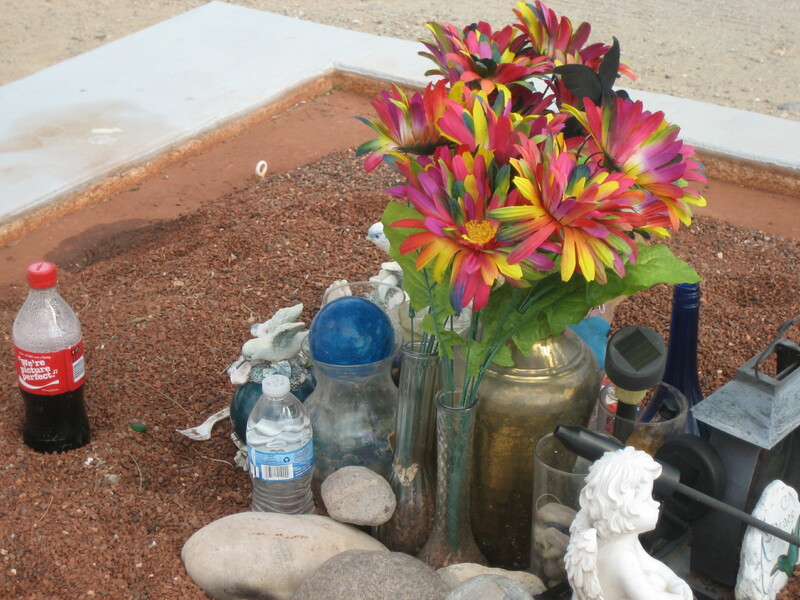 In the Ajo Cemetery, I encountered grave sites upon which other beverages had been left. 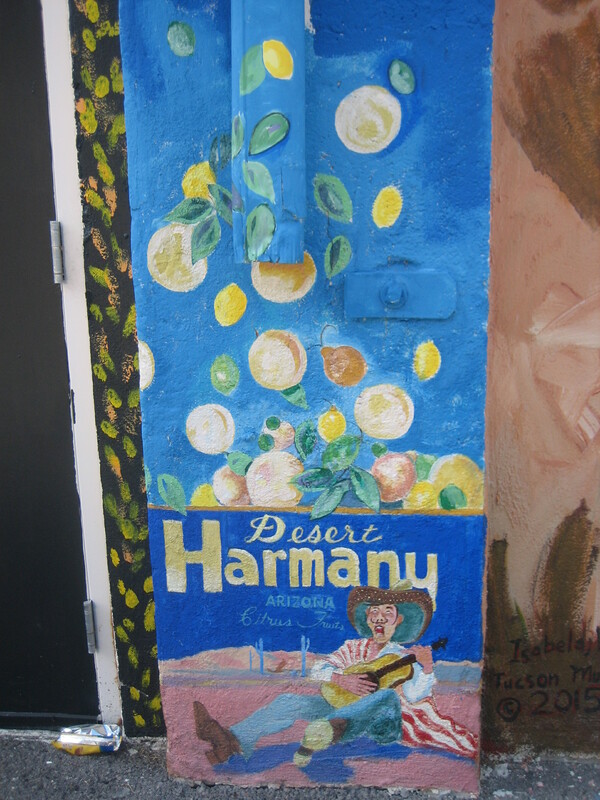 I saw bottles of water, Coca-Cola, and Jarritos. I wonder if this offering for the dead is particular to the dessert. 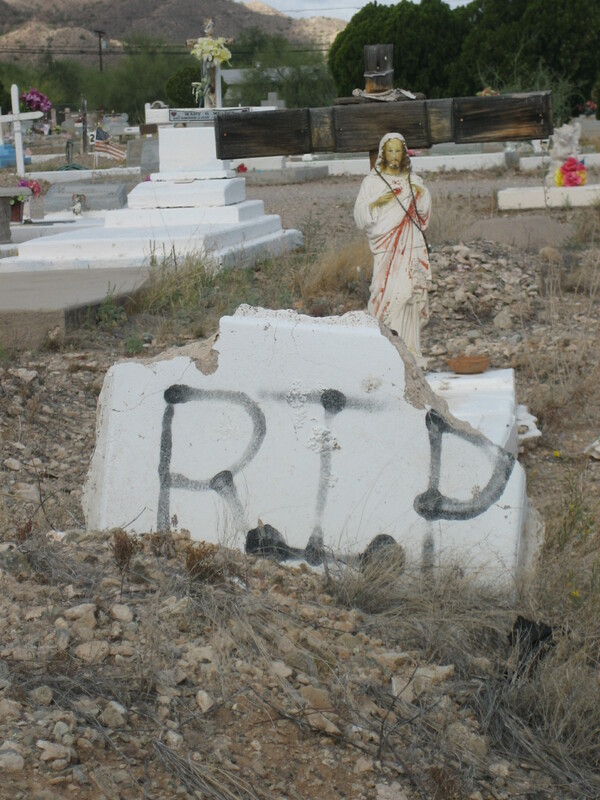 I saw several creepy things at the Ajo Cemetery. 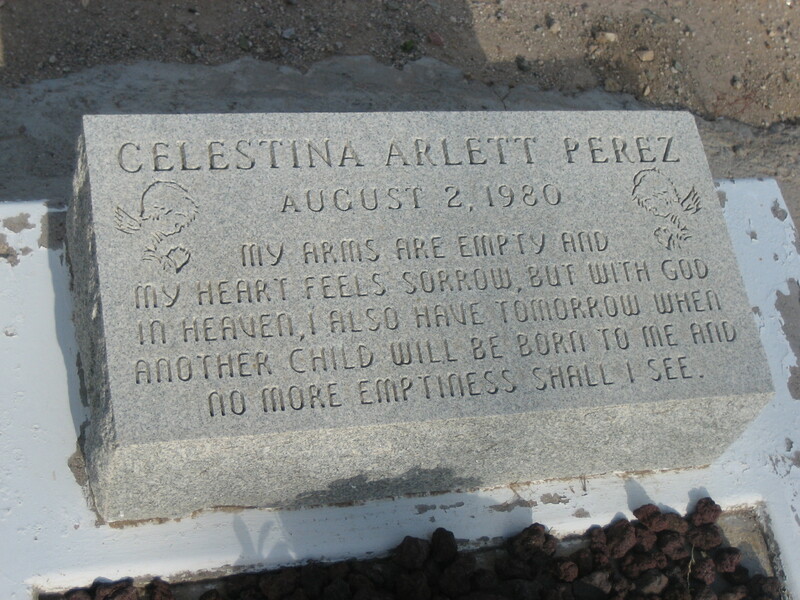 The first creepy thing I saw was a rather disturbing inscription on the headstone marking a baby’s grave. I’m not trying to be snarky or offensive about someone else’s grief or how that grief is expressed. I know that people mourn in different ways. Also, I give this family props for staying optimistic in the face of losing their baby. But I feel freaked out by this sentiment of “my baby’s dead, but God will send me a new baby, and I won’t even miss the old baby.” Let’s just say I don’t think this is the way I would grieve my lost child. The second creepy thing I saw was a collapsing grave. Yes, I got as close as possible so I could look into the hole. Yes, I stepped gingerly, gauging my weight so I wouldn’t fall in. Yes, I experienced a mild fear of an arm reaching out and grabbing my ankle. No, I didn’t see a coffin or bones. No, nothing grabbed my ankle. I hope someone comes along soon and repairs Donald P. Harrison’s grave. The third creepy thing I saw harkens back to the DIY grave markers. It may be a bit difficult to believe that I actually encountered in a cemetery the grave represented in the next photo, but I promise you, the photo shows exactly what I saw. 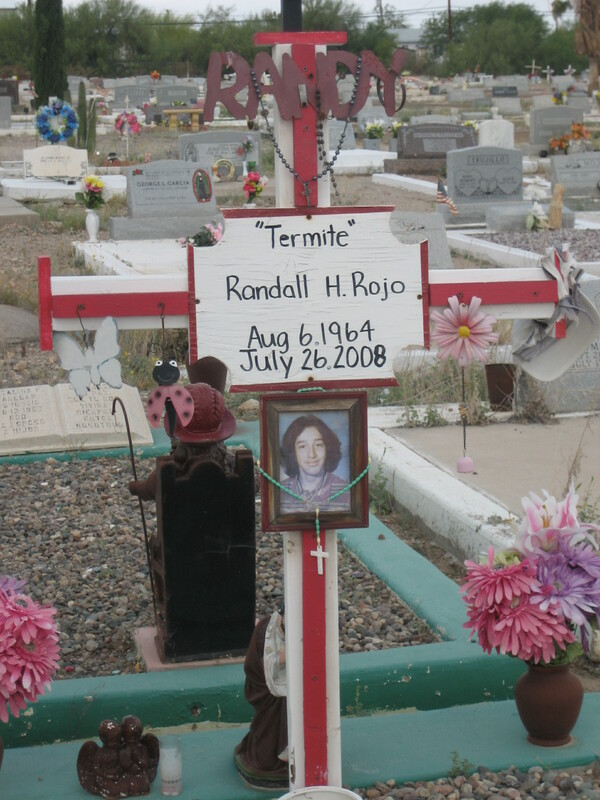 I saw so many graves of children in this cemetery. It seemed like there were more children’s graves than I normally see in graveyards. 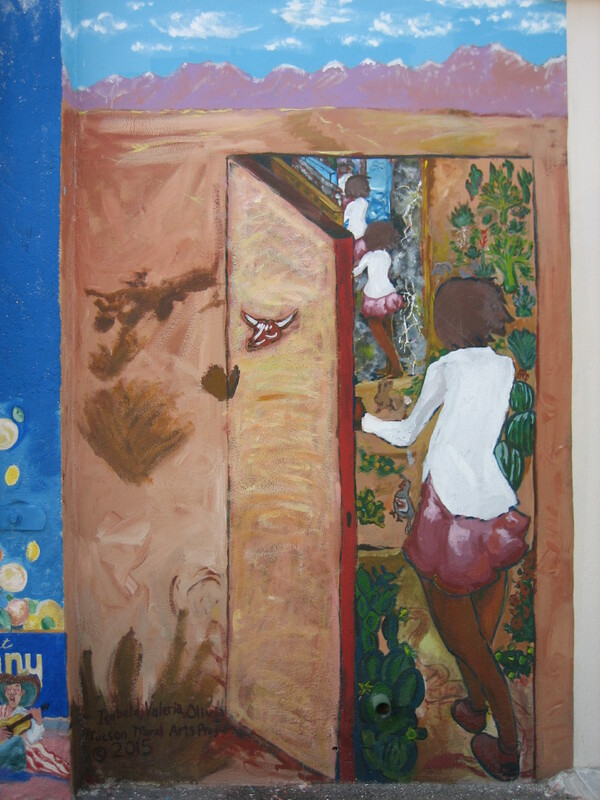 Maybe Ajo was not only a town with families (as opposed to settlements populated with predominantly hard-living men), but a place where life was rough and survival was difficult. All of those graves of kids got to me, and I felt rather melancholy when I left. 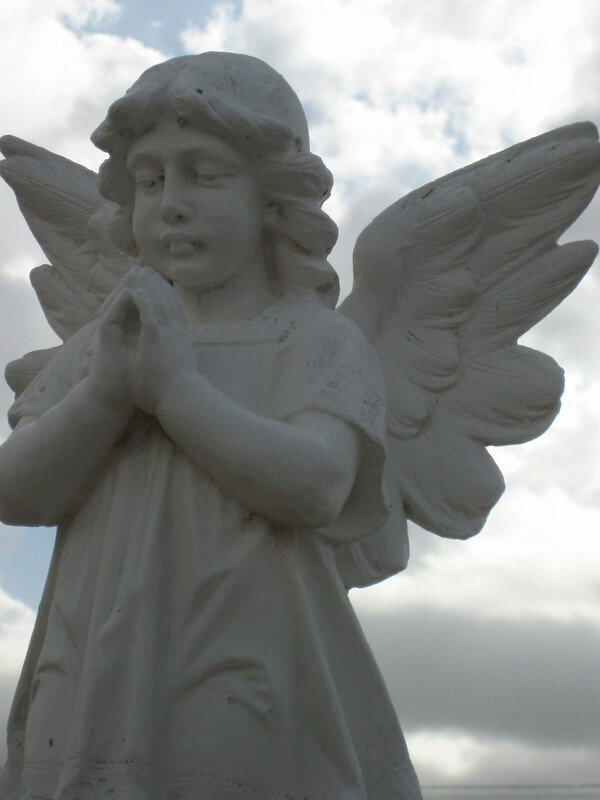 I think cemeteries are making me sadder as I get older. 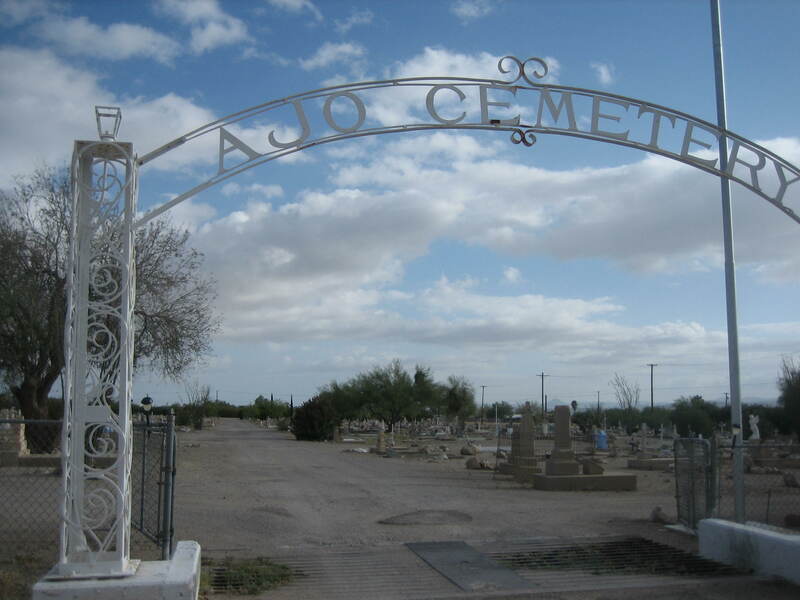 Ajo cemetery is located at 1181 Cedar Street in Ajo, Arizona. As soon as I found the Ajo Plaza, I went into the thrift store on the corner. I shop primarily at thrift stores, and even if I don’t buy anything, I like to see what different stores have for sell. I hadn’t been there very long when I started chatting with the two women in the store. 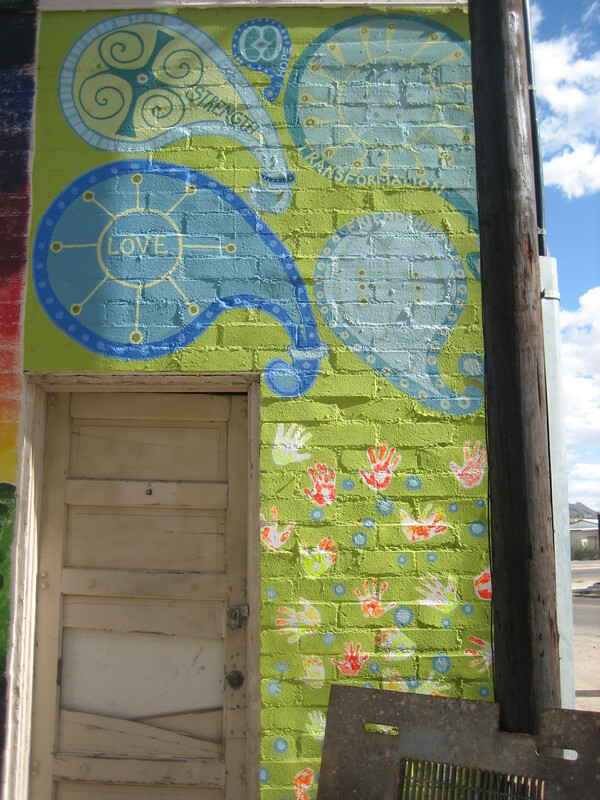 They were talking about Hatch, New Mexico, and I told them what I knew about the area. 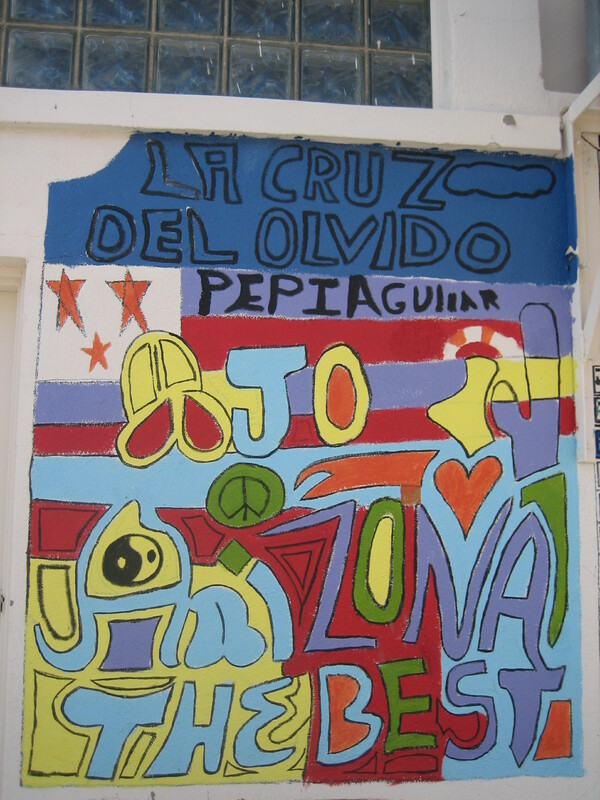 When it was determined that I was visiting Ajo, one of the women told me I needed to visit Quitobaquito. 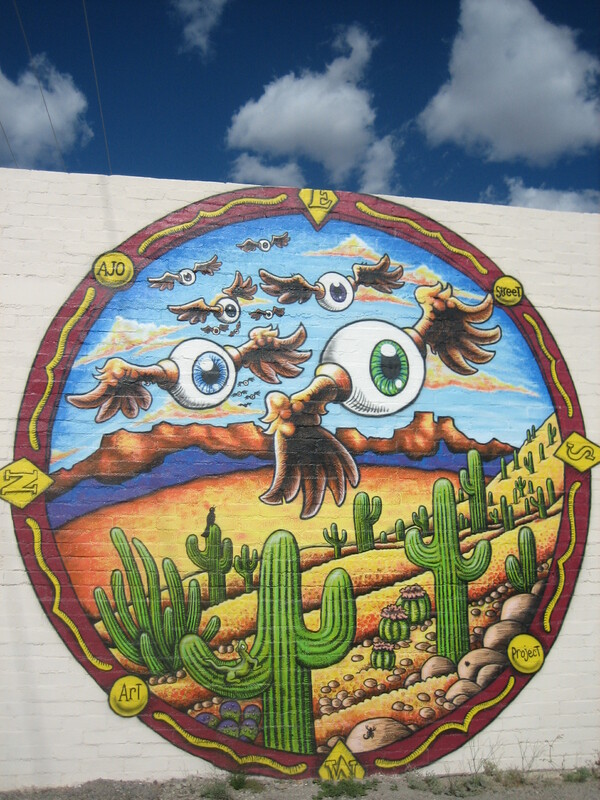 She said Quitobaquito was in the Organ Pipe Cactus National Monument. She said it was an oasis in the desert, but warned me not take the route given on the tourist information. She said that was the long way around, then gave me some quick directions I didn’t understand, referring to roads I’d never heard of. I assured her I’d make it there if I could. I meant it too, because the place sounded interesting and exotic. 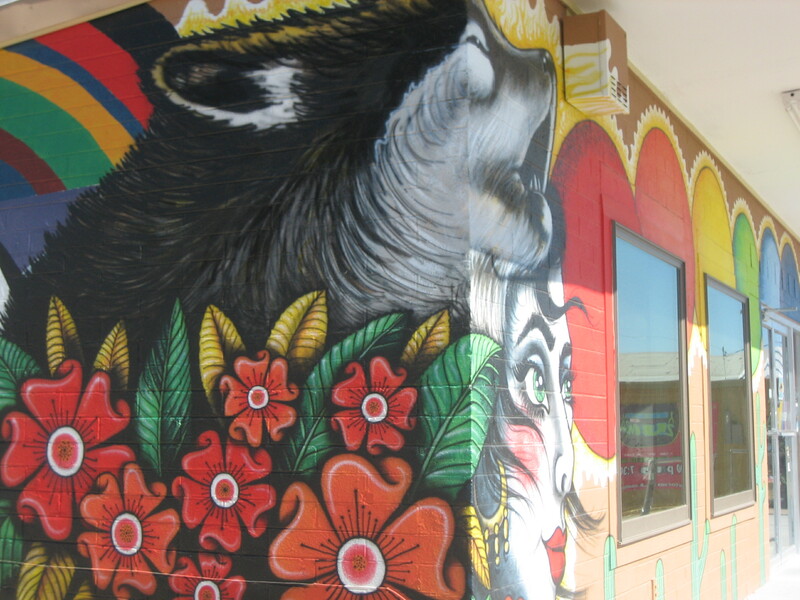 When I asked my friend Coyote Sue–who lives down the road in Why, AZ–about Quitobaquito, she said she’d never heard of it, so she wasn’t able to give me directions. 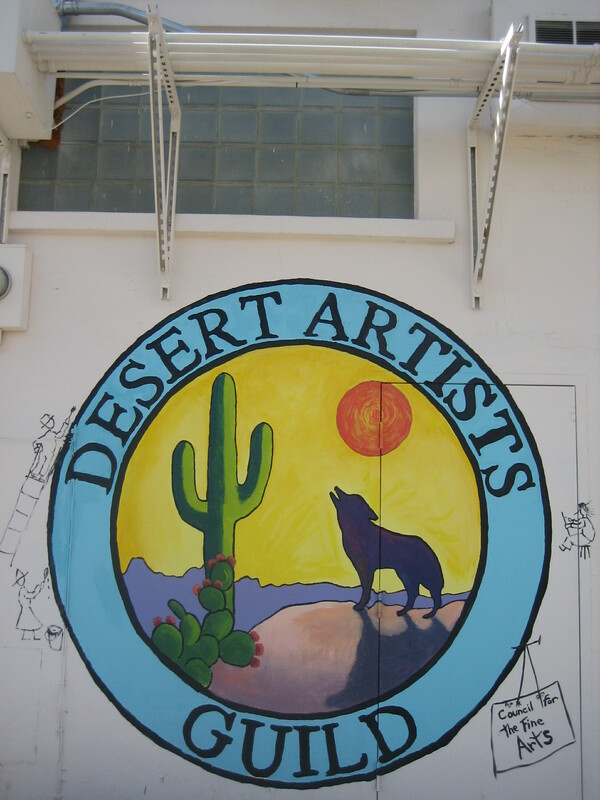 Join a ranger at this gorgeous desert oasis and learn about the animals and its rich cultural history. 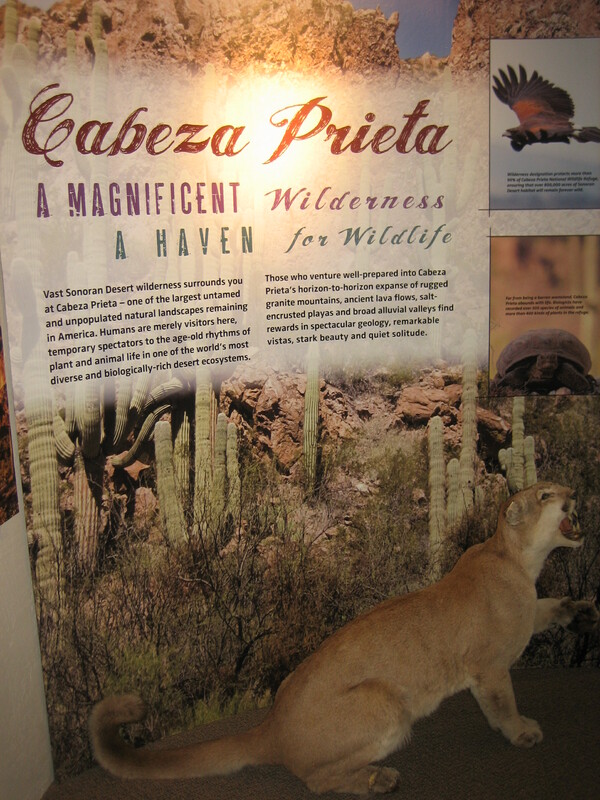 Meet the ranger at Quitobaquito or contact the visitor center to reserve a spot on the van. On the morning of the tour, we hit the road plenty early to get to the pick-up spot at the visitor center in time, but when we got out to the highway, we saw a state police roadblock. Oh no. A female officer approached Miss M’s car. She told us the border was closed. When Miss M asked why the border was closed, she said they had no information. Miss M told her we weren’t planning to cross the border or even go near it. When Miss M said we were headed to the National Monument, the officer said no problem, and the cops let us through. At that point, both Miss M and I knew we probably weren’t going to be able to visit Quitobaquito that day. 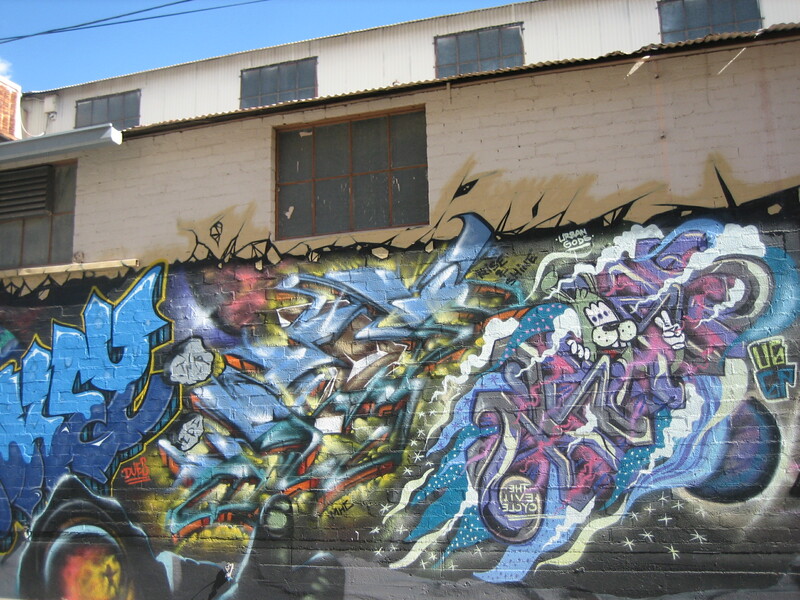 a mere two hundred yards from the U.S.-Mexican border. No way was the National Park Service going to let a small group of tourists traipse around so close to the border while some sort of incident was occurring. 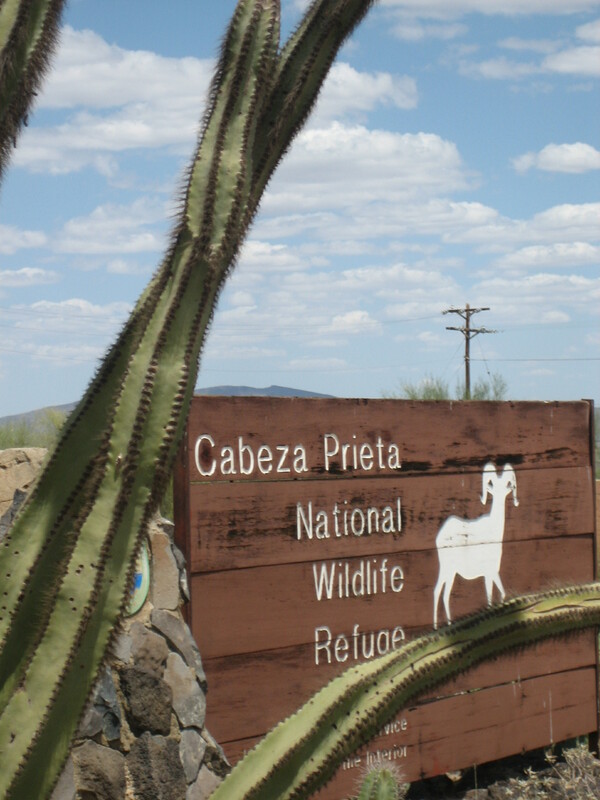 When we arrived at the visitor center and told the ranger about the roadblock and the closed border, he told us he hadn’t heard anything about it. 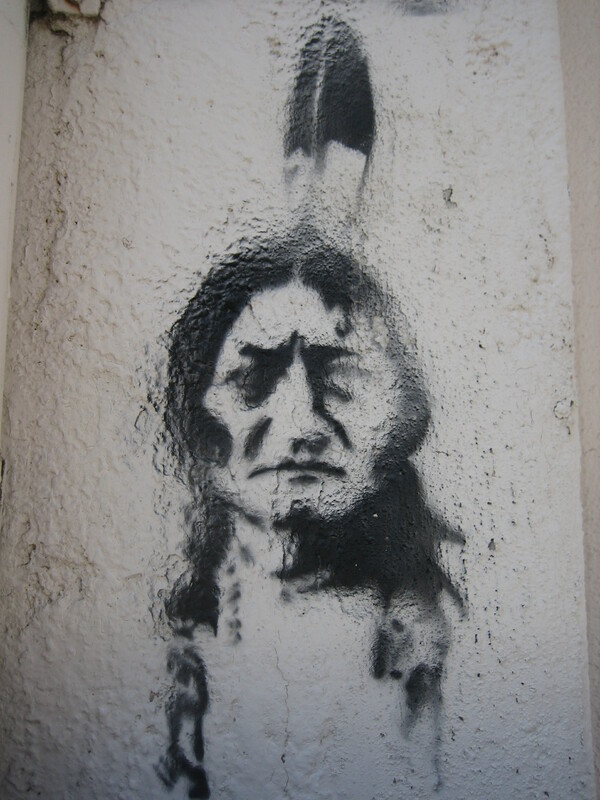 However, over the next half hour, the ranger got word that the border was closed, it had been closed by Mexico, and there would be no location talk at Quitobaquito that day. 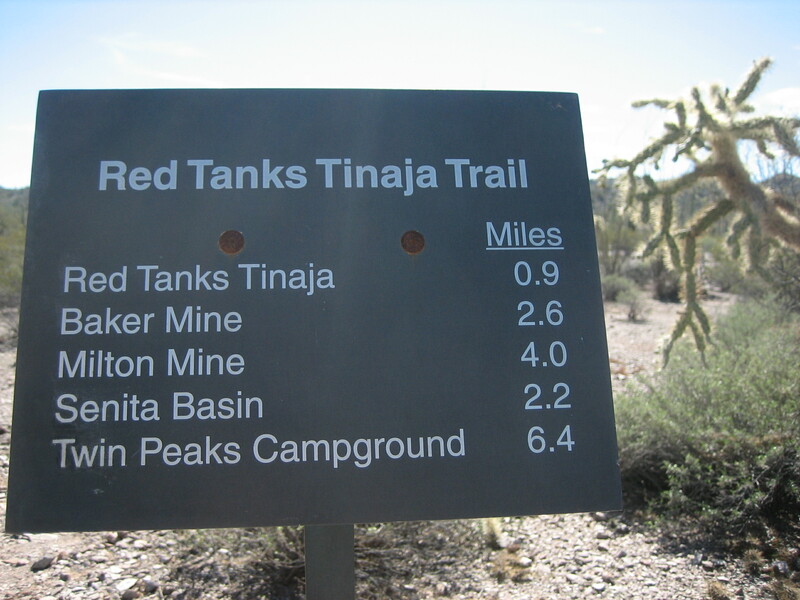 He offered instead to lead a short hike (about a mile and half round trip) to the Red Tanks Tinaja. I was disappointed. I’d been really excited to see Quitobaquito. 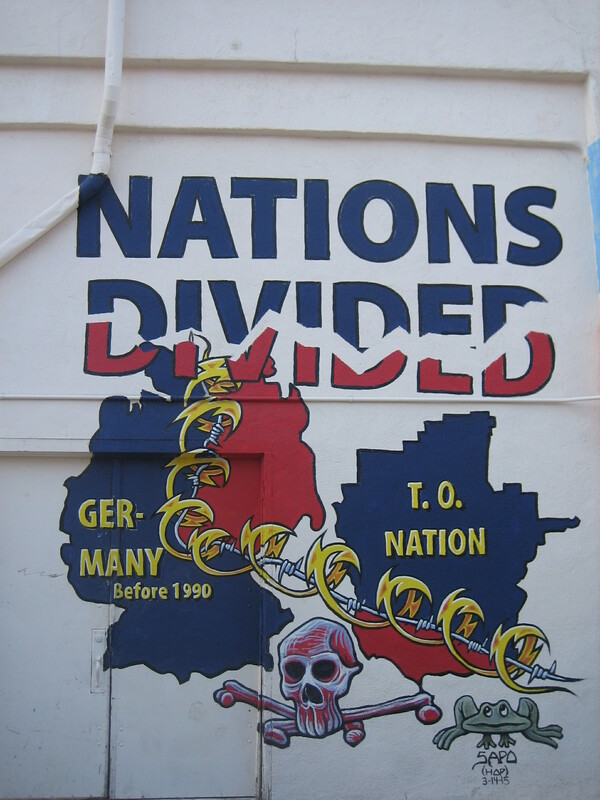 But I knew Miss M wasn’t going to drive out there while an international incident was possibly in progress, and I wasn’t going to go get my van to drive out there on my own, so Red Tanks Tinaja it was. The trail begins as a narrow footpath, but soon merges with an old two-rut wagon trail. 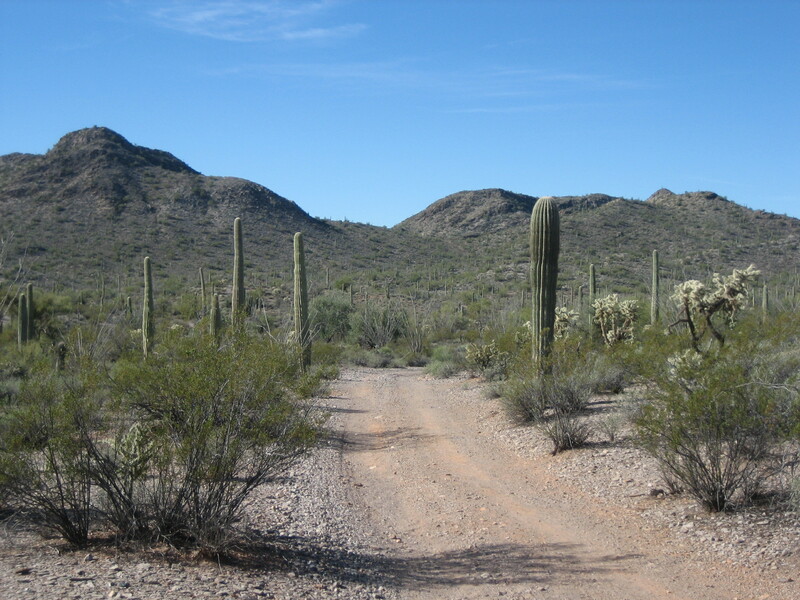 The wagon road runs southwest across desert flats studded with tall saguaros. 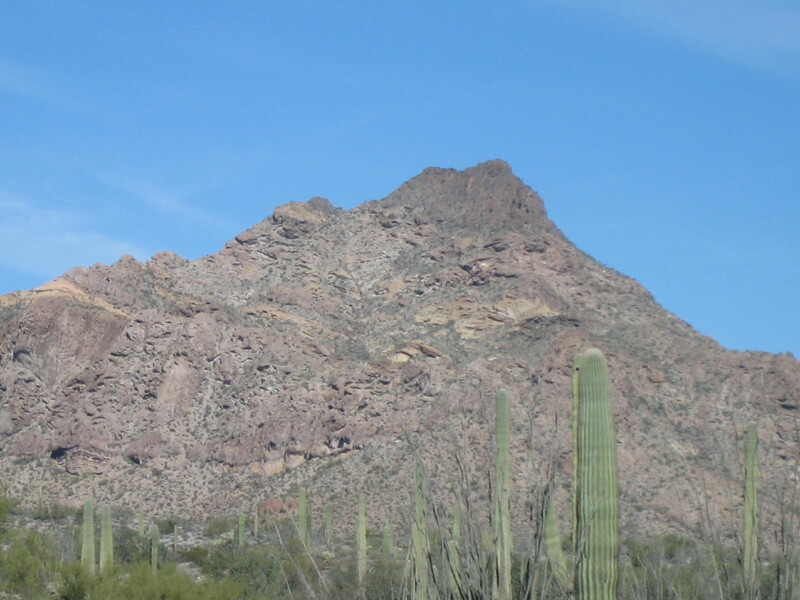 Far to the east, the Ajo Range towers beyond the lesser crags of the Diablo Mountains. The cloud-rending spire of Pinkley Peak crowns conical hills to the north, while the crest of Twin Peaks rises above foothills to the south. This is the trail after it merged with the old two-rut wagon road. 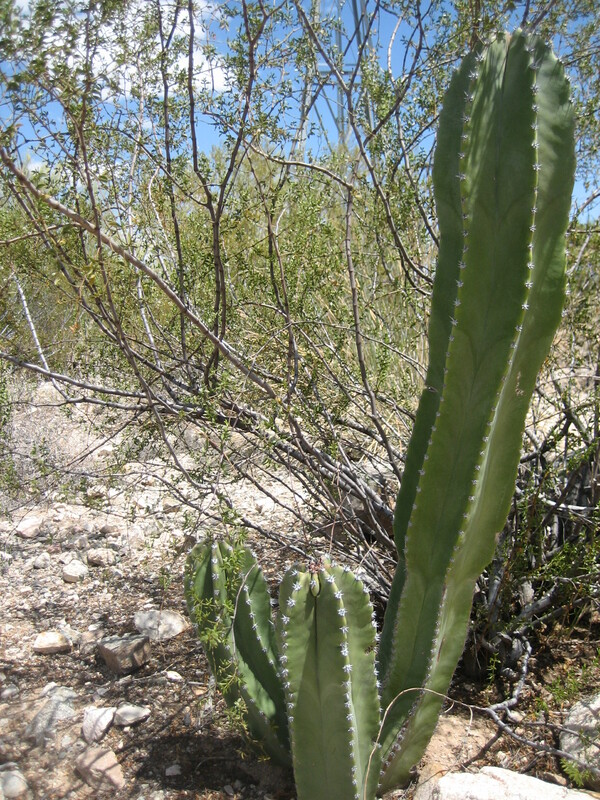 Several saguaros as well as teddy bear cholla are visible on either side of the trail. The short bushes with green leaves are creosote bushes. I have no idea what direction I was facing when I took this photo. Tinaja is a term originating in the American Southwest for surface pockets (depressions) formed in bedrock that occur below waterfalls, are carved out by spring flow or seepage, or are caused by sand and gravel scouring in intermittent streams (arroyos). 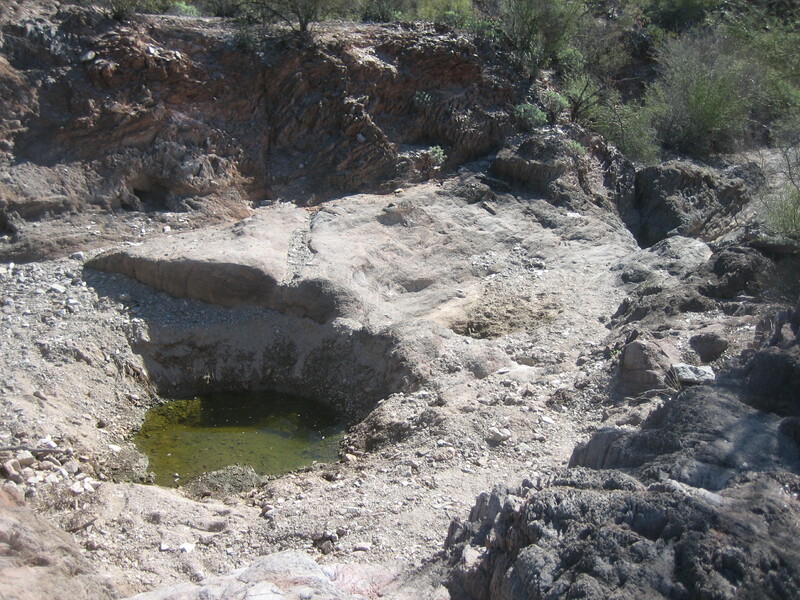 Tinajas are an important source of surface water storage in arid environments. These relatively rare landforms are important ecologically because they support unique plant communities and provide important services to terrestrial wildlife. This is the tinaja we hiked to. Our ranger guide was pleased to see the water in the tinaja. While I was sorry to have missed out on Quitobaquito, I did enjoy this hike very much. Again, the ranger was knowledgeable and informative. 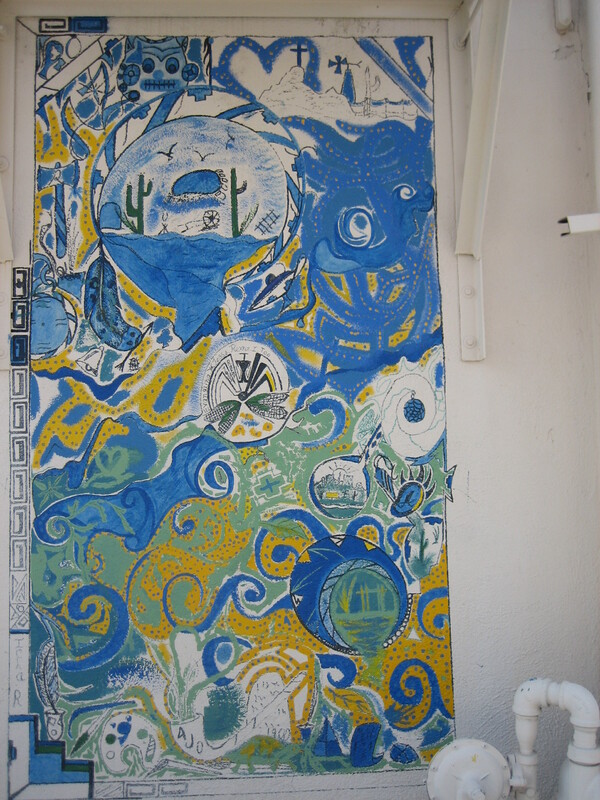 I would have enjoyed being out in the desert and seeing new places and plant life, but I found it much better to make the journey with an experienced guide who could explain what I was seeing. A wily promoter, A.J. Shotwell, enticed John Boddie of Missouri to help set up the St. Louis Copper Company in 1890s. Shotwell organized the rescue [of] Copper Company when bankruptcy threatened. 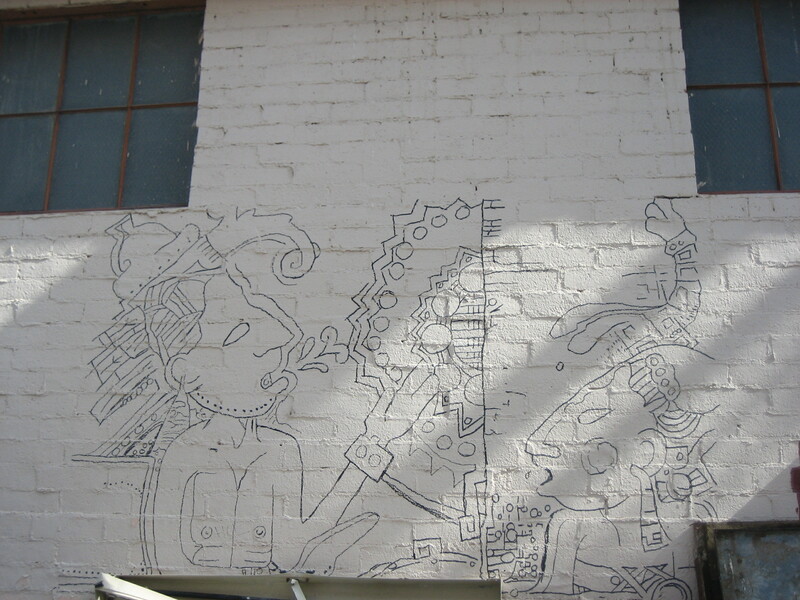 This became the Cornelia, then the New Cornelia, named after Boddie’s first wife. “Professor” F.L McGahan and Shotwell introduced the so-called vacuum smelter that supposedly channeled each type of molten ore to different spigots and ran perpetually on the initial fuel. 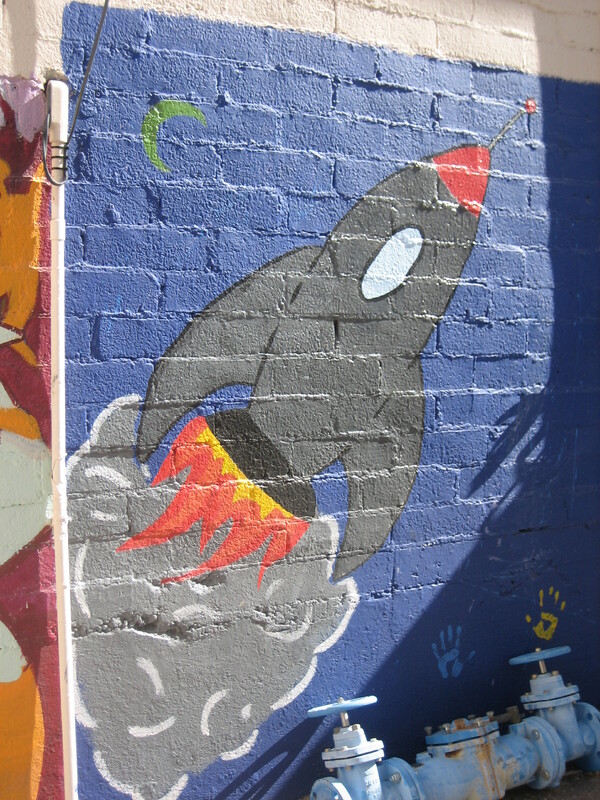 Mcgahan [sic] conveniently slipped away from the demonstration model in Los Angeles –it exploded when been [sic] tested. 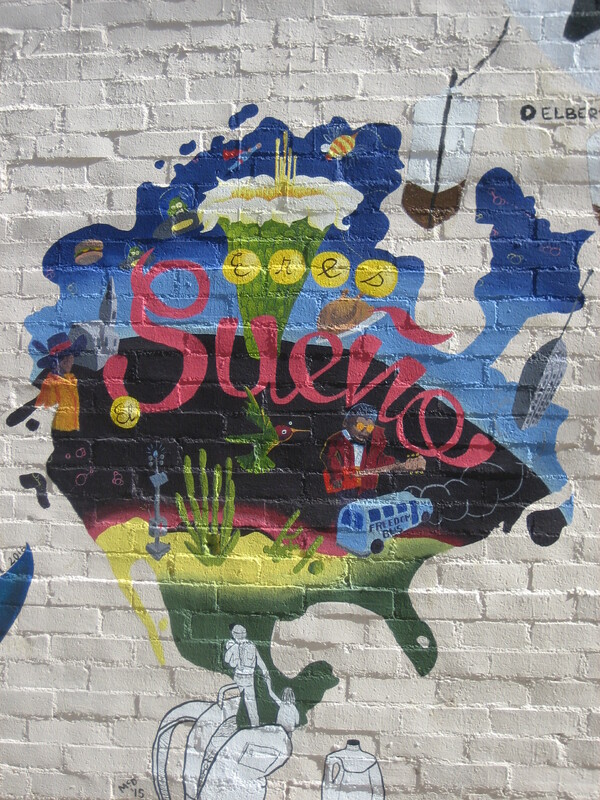 Ajo continued as the quintessential southwestern mining town, with occasional strikes and shutdowns, until 1983. 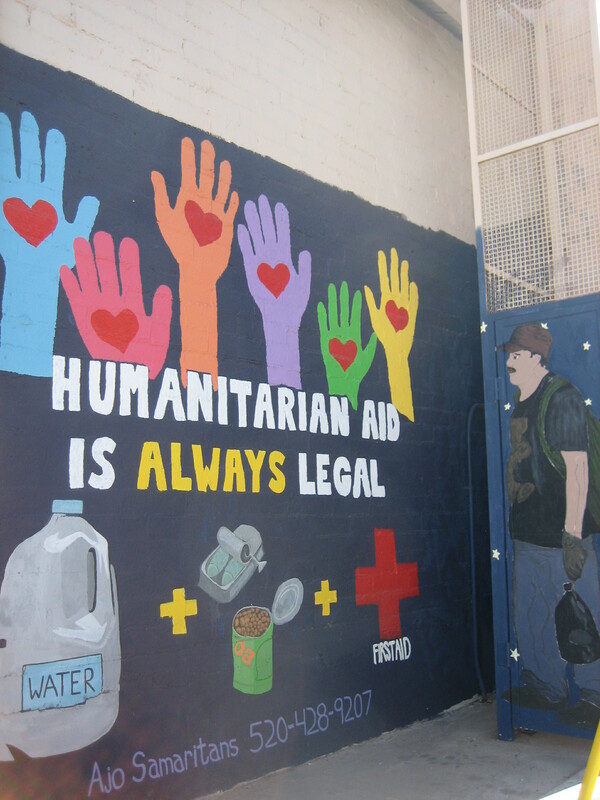 The strike that began in July that year crippled the community with acrimony on both sides. 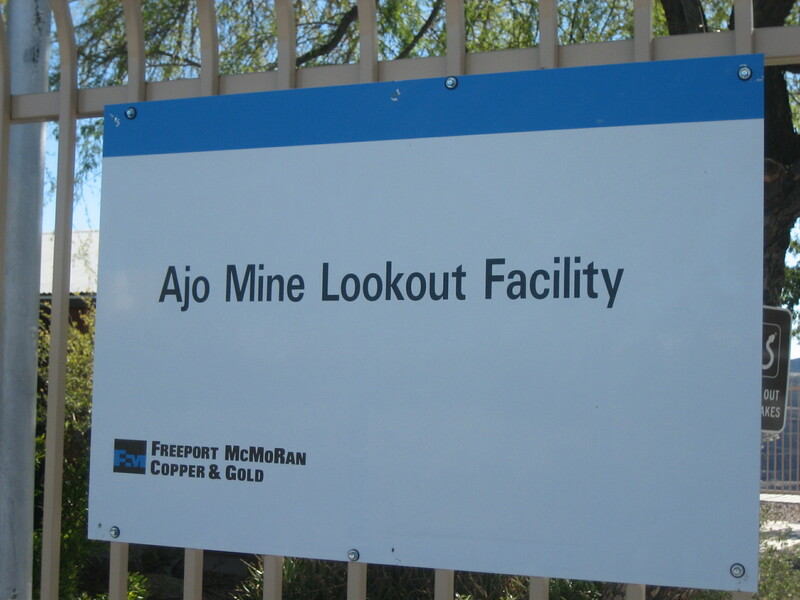 Though the mine struggled on with non-union labor, copper prices plummeted and so did Ajo. Mining stopped in 1985. 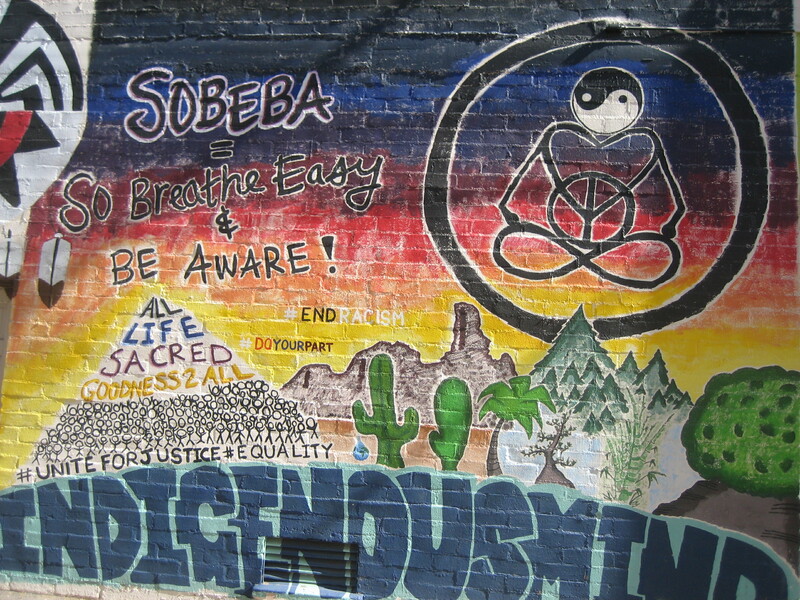 P[helps] D[odge] remained a presence in the community but sold much of its holdings, including the Plaza and the company housing. 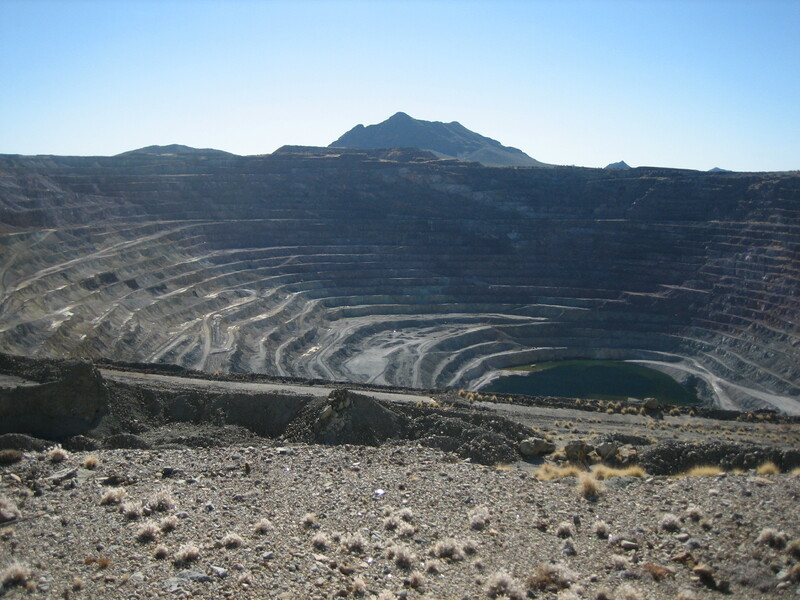 The remaining mines [sic] property is now owned by Freeport-McMoran [sic] Gold and Silver, Inc., which merged with Phelps Dodge in 2007.
is a huge open pit operation (about 3,000 feet long and nearly 2,000 feet wide) at 750 feet deep. Haulage was by internal railroad installed in the pit. Total production from 1917 through 1972 amounts to some 350,000,000 tons of ore…Higher grade ore was mined in the early years and lower grade ore in more recent years. 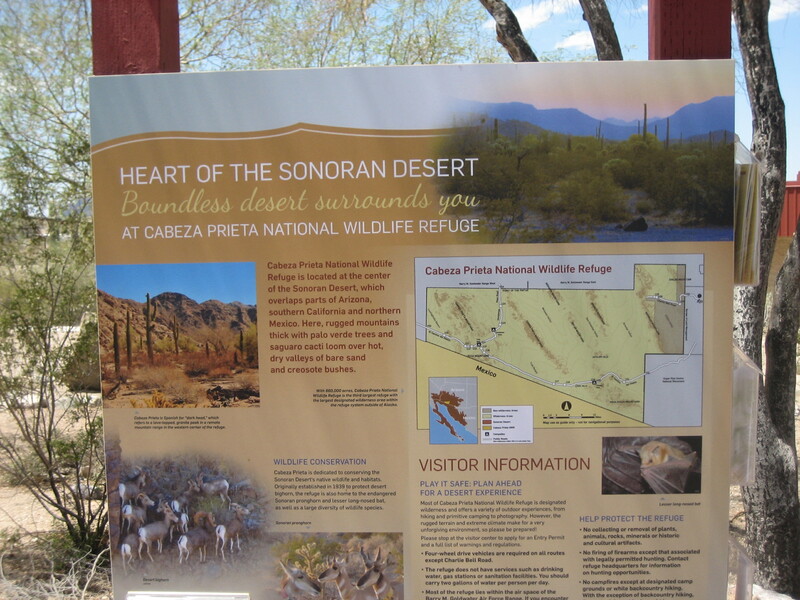 I picked up a sheet of “Mine Facts” at the Ajo visitor center. The question and answer format gives a lot of information about the mine. 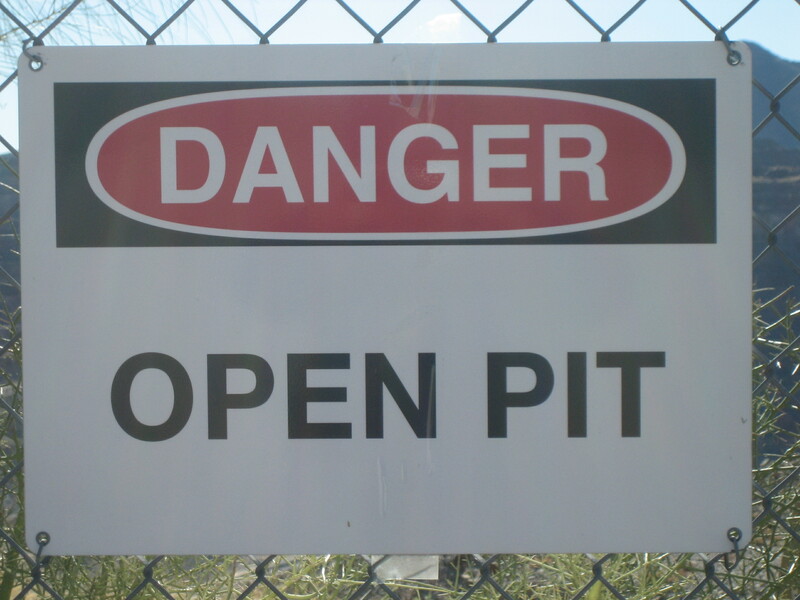 Tell us about the open pit? First, three green hills were leveled from 1916 to 1930. Each bench of the pit is forty feet deep. In all, it is 1 1/2 miles wide and 1 1/4 miles across. Currently it is 1100 feet deep. And what about the lake at the bottom? The water, about 90 to 100 feet deep in places, is spring fed…The color is from the copper sulfite. How does this mine compare with others? 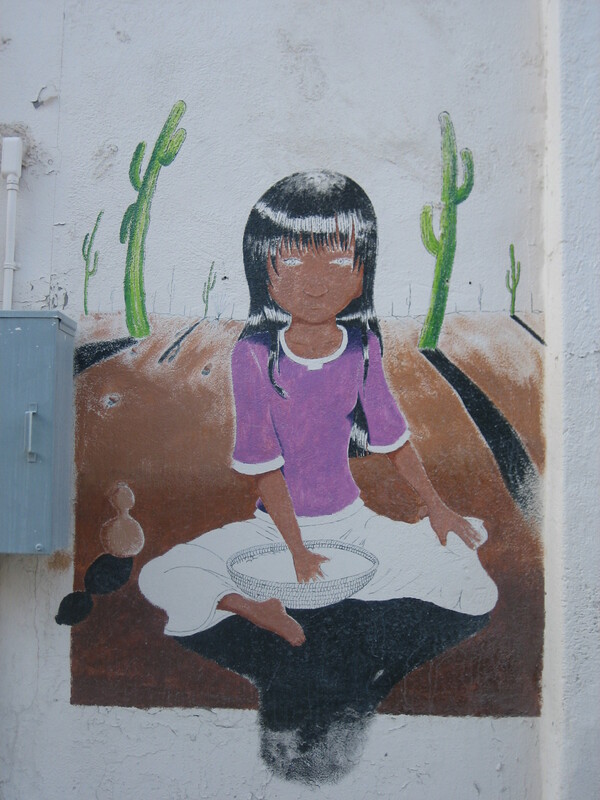 At one time the New Cornelia was the largest producer of copper in Arizona. 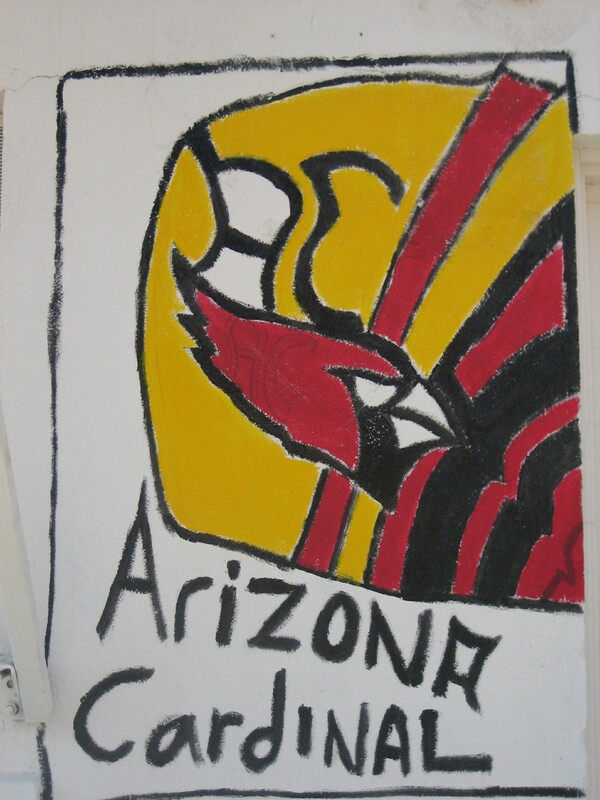 In 1959 it was the third largest open-pit mine in the United States and the second largest copper producer in Arizonza. 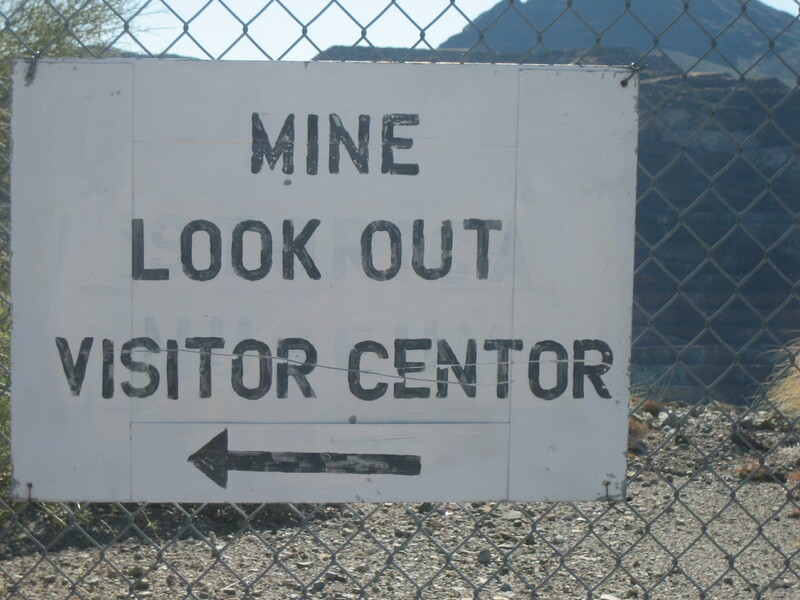 There is a mine lookout and visitor center (open October through May) on Indian Village Road. I went out there early one morning before it got too hot. There was an elderly man standing outside the visitor center. When I asked him if the lookout was open, he told me it was. He told me a lot about himself and the mine. 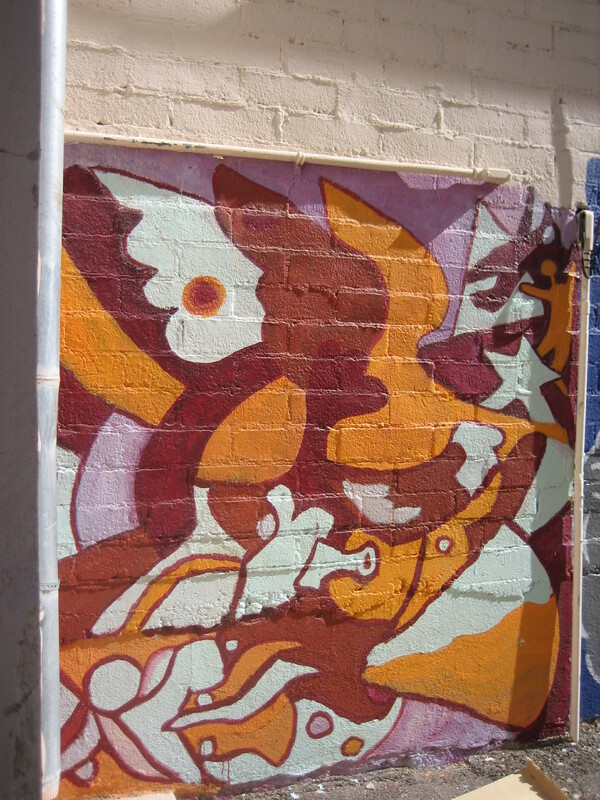 He first came to Ajo with his father in 1949. He worked at the mine in the maintenance department for over 32 years. He told me that when he worked in the mine, equipment was expensive and men were cheap. He said that’s how thing are in China now, which is why there’s more mining going on in China than the U.S. He said there’s still copper in the mine, but it’s low grade, and right now it’s not profitable for Freeport-McMoRan to extract it. 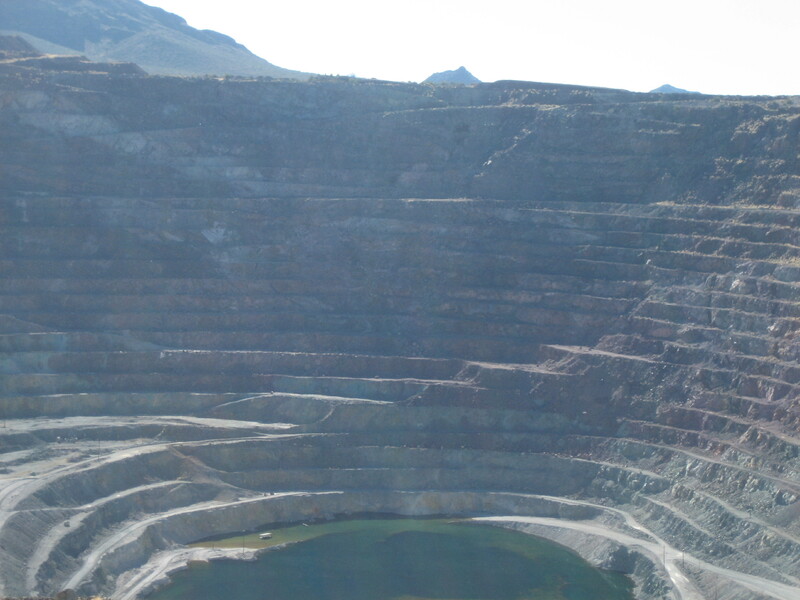 However, Freeport-McMoRan gets tax breaks on the mine, so it’s in the company’s best interest to hang on to the mine until it is again profitable to extract the copper. Yes, mining operations shut down in 1984 and the smelter closed in 1985. At its peak about 3000 were employed. Did the mine close because of labor unrest? No. The mine continued operating during and after the strike of 1983. 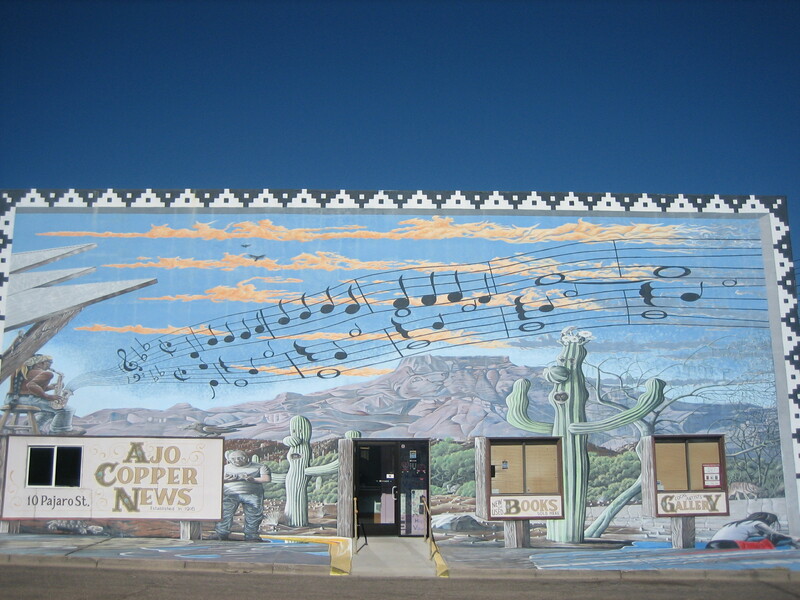 Falling copper prices resulted in the closure of many Arizona mines in 1985. Can the mine ever be re-opened? A large quantity of low-grade ore remains. 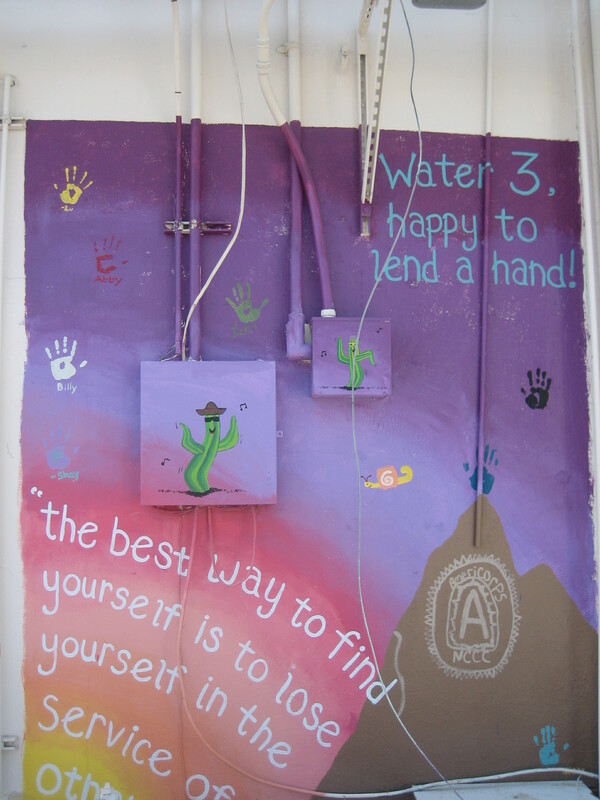 It depends upon the demand for copper and the plans of the owner. When the mine closed it was capable of producing 40,000 tons of copper annually. The wall of each terrace is 40 feet tall. Each “bench” (the flat part of the terraces) is 40 feet wide. When the mine was open, trains chugged around on those terraces. How was the ore hauled up? I cannot put into words how big this mine is. Unfortunately, my photos don’t do justice to massiveness of the open pit. Trust me, it’s fantastic, in an Oh, no, what have we done? 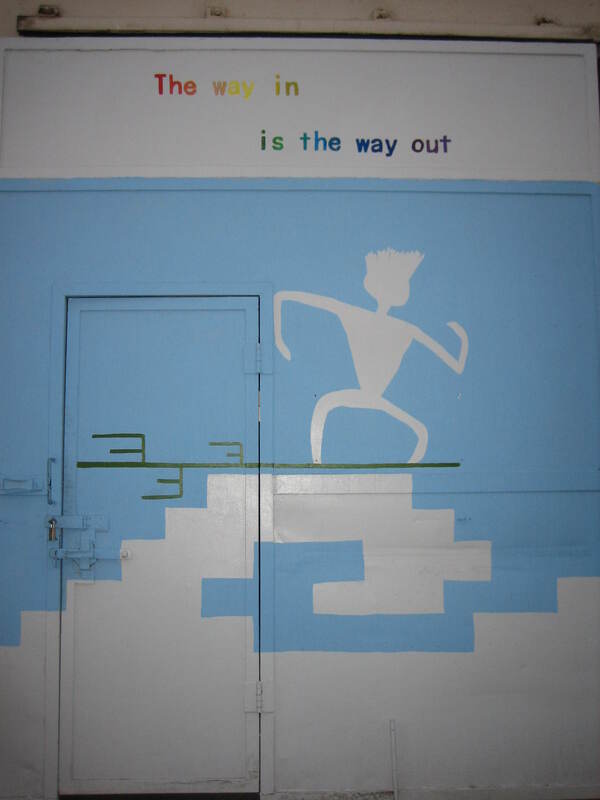 sort of way.